Showing items in category Orange Free State/Orange River Colony, sorted by newest listed first. ORANGE RIVER COLONY - 1904 1d carmine PSE 'cto'd' by scarce BRITISH ASSN/O.R.C. cds. H&G 2a. 1904 1d carmine on cream postal stationery envelope (size d) 'cancelled to order' (no address) by rare s/r BRITISH ASSN/O.R.C. cds dated SE.4.1905. A scarce use from the 1st tour struck at Kimberley. H&G 2a. 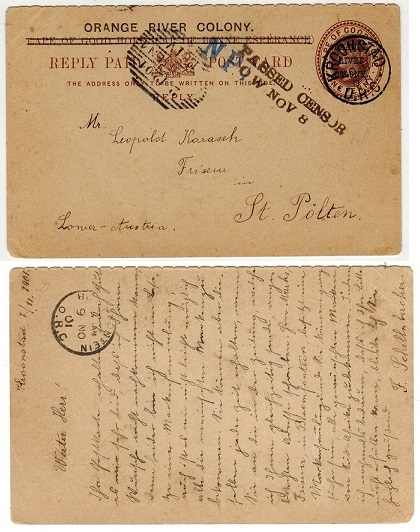 ORANGE RIVER COLONY - 1900 1d rate 'POW' censored cover cancelled ARMY/B-PN/TELEGRAPHS. 1900 (26.VII.) 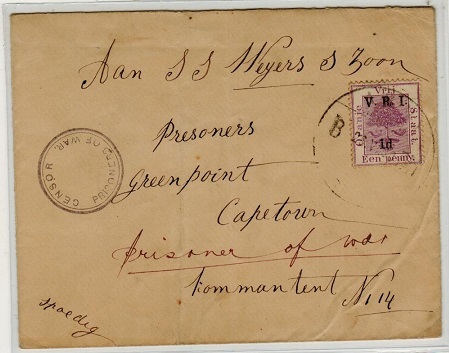 cover addressed to a prisoner of War at the Greenpoint POW Camp at Capetown (central fold) bearing 1d on Een Penny violet 'VRI' adhesive tied by ARMY / B - PN / TELEGRAPHS cancel with BLOEMFONTEIN transit cds on reverse and struck CENSOR/PRISONER OF WAR. 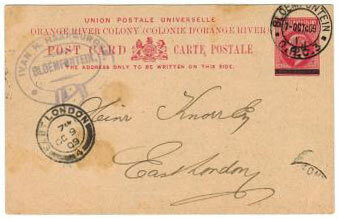 ORANGE RIVER COLONY - 1900 1d 'GB' PSE uprated at FPO/31 used at HEILBRON. 1900 (JU.2.) 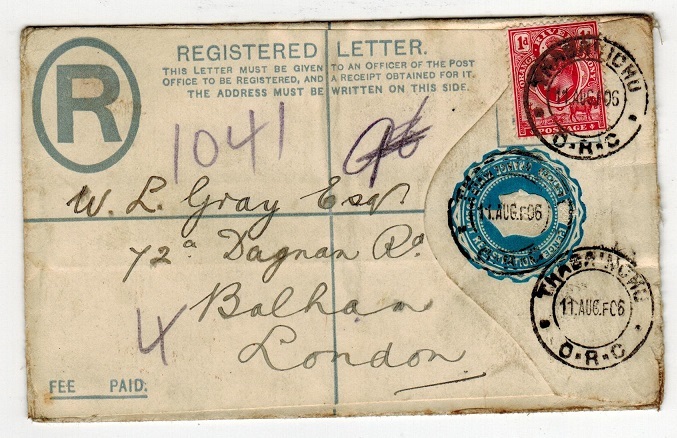 use of GB 1d postal stationery envelope addressed to Germany bearing additional GB 1d lilac tied by neat FIELD POST OFFICE/31/BRITISH ARMY S.AFRICA cds's. Number 31 being located at Heilbron in OFS at this time. 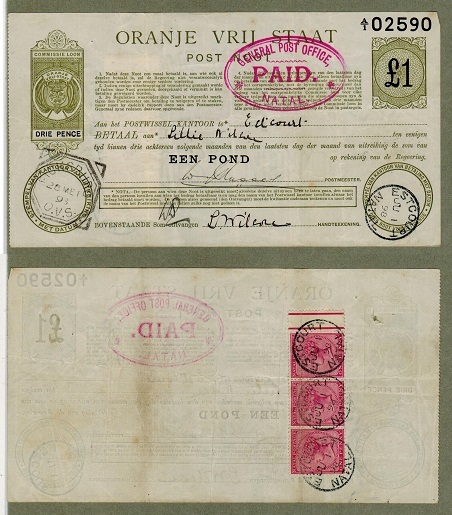 ORANGE FREE STATE - 1893 4d rate cover to Holland cancelled by 'X' duplex. 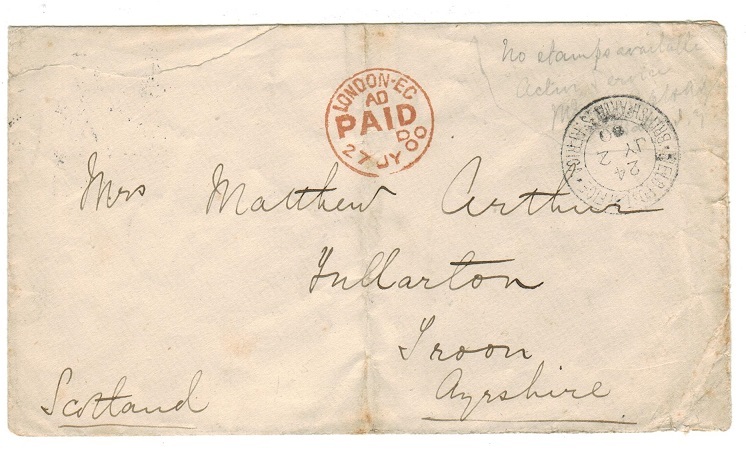 1893 cover addressed to Holland (odd tone spot) bearing 2d violet adhesive pair tied by grilled 'X' duplex with weak VERDE 'proving' cds on reverse and HELIBRON transit dated AP.2.93. 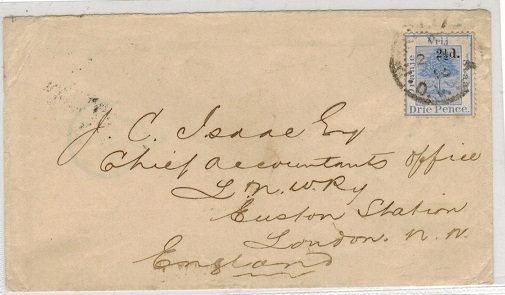 ORANGE FREE STATE - 1895 2 1/2d rate cover to UK used at CLOCOLAN. 1895 (AU.9.) 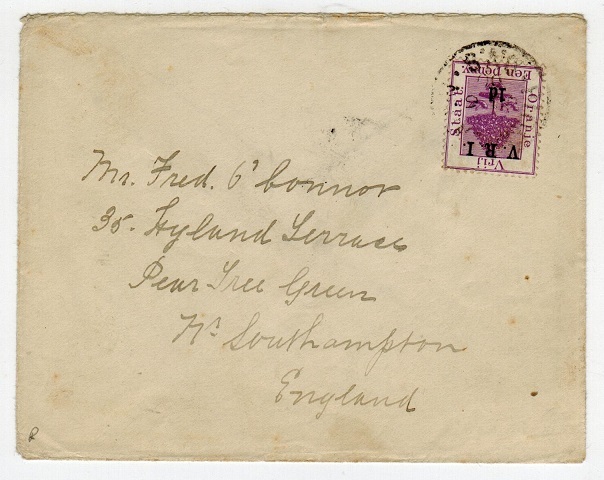 cover addressed to UK bearing 1/2d and 1d pair tied by CLOCOLAN/O.V.S. cds with BLOEMFONTEIN transit b/s and WEST NORWOOD arrival. 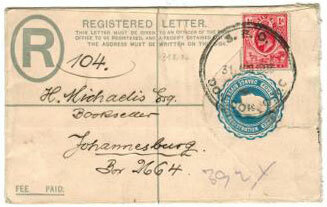 ORANGE FREE STATE - 1895 2d rate cover to Johannesburg used at CLOCOLAN. 1895 (JY.13.) 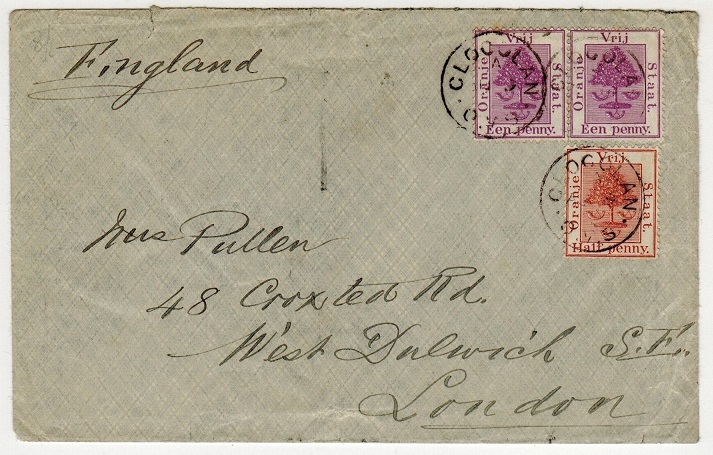 cover addressed to Johannesburg (roughly opened on reverse flap) bearing 1d violet pair tied by violet CLOCOLAM/O.V.S. cds's with black boxed TE LAAT instructional h/s's across the stamps but unfortunately unreadable. ORANGE FREE STATE - 1895 2 1/2d on 3d blue on cover to UK used at BLOEMOMFONTEIN. 1895 (2.JU.) cover addressed to UK bearing 2 1/2d on 3d blue adhesive surcharge (SG 67) tied by light BLOEMFONTEIN cds. ORANGE FREE STATE - 1896 1/2d black on 3d mint showing SURCHARGE DOUBLE. SG 75a. 1896 1/2d black surcharge on 3d ultramarine adhesive in fine mint condition showing the variety SURCHARGE DOUBLE. SG 75a. ORANGE FREE STATE - 1891 1/2d chestnut PSC with '15' duplex from BETHANY. SG P2c. 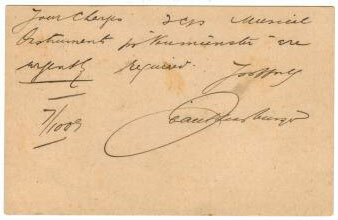 1891 1/2d chestnut postal stationery stamp card (SG P2c) addressed to Johannesburg and cancelled by '15' duplex in blue-black of Bethany. 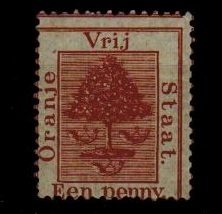 ORANGE FREE STATE - 1889 use of Cape 1d PSC used with 1d brown 'OFS' cancelled by '18' duplex. 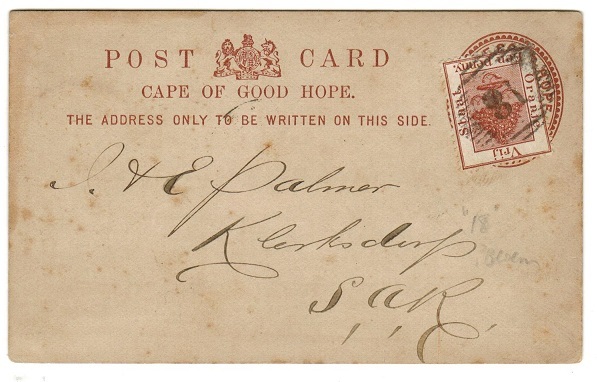 1889 (SEP.14) use of Cape of Good Hope 1d postal stationery p'card (H&G 2) addressed to Klersdorp bearing 'OVS' 1d brown tied by barred '18' duplex of Bloemfontein. 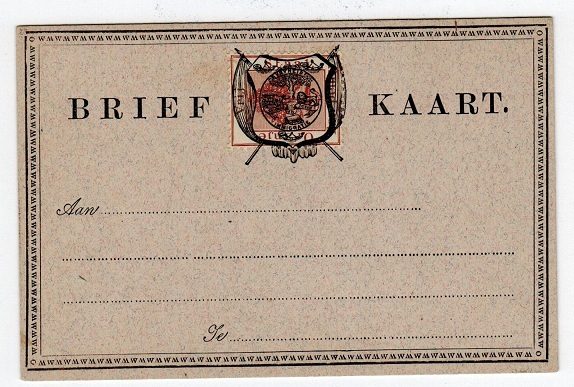 The card being preprinted on reverse for use by 'Hirsch Loubser & Co.'. An unusual use of this Cape card from Orange Free State. ORANGE FREE STATE - 1868 1d deep brown mint with MISPLACED PRINTING. SG 3. 1868 1d deep brown in mint condition showing the MISPLACEMENT OF STAMP. SG 3. 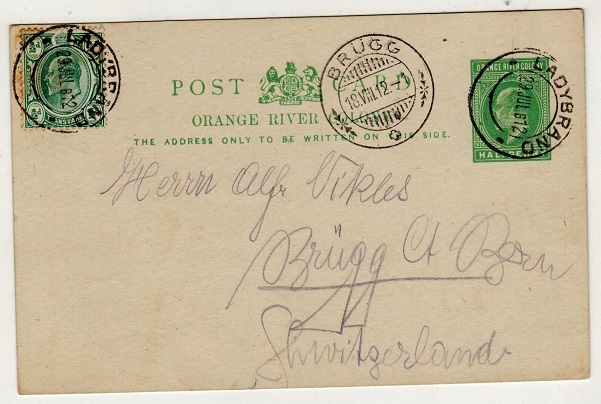 ORANGE FREE STATE - 1900 1/2d outward section of 1/2+1/2d PSRC to Germany uprated at WINBURG. 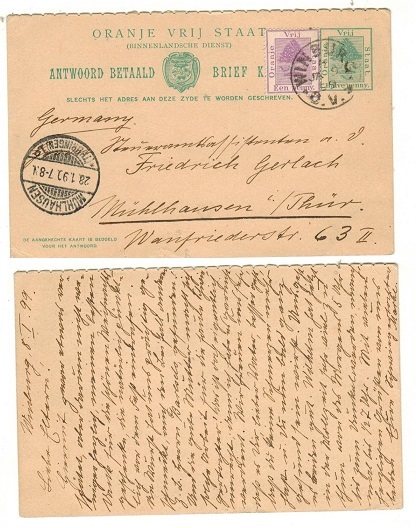 1900 1/2d green outward section of the 1/2d + 1/2d reply type postcard addressed to Germany and bearing additional 1d violet adhesive tied WINBURG/OVS and dated JA.9.99. Genuine use. H&G 18. 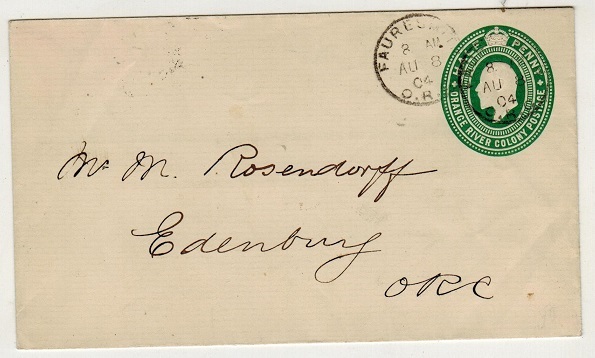 ORANGE RIVER COLONY - 1902 1/2d green PSC to UK used at REITZ. H&G 35. 1902 1/2d green on cream postal stationery postcard addressed to UK (crease at right) cancelled by REITZ/S.AFRICA cds dated 27.FEB.13 but being underpaid having sexagonal 'T/10c' tax mark applied. Written at Gomvlei which did not have a PO at this time. H&G 35. 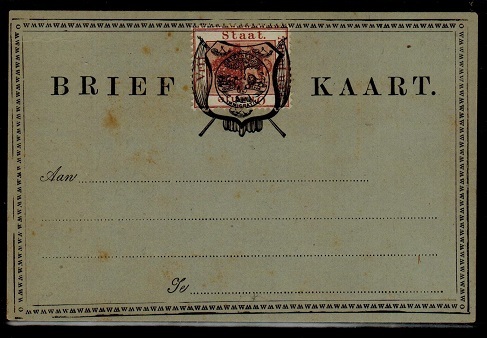 ORANGE FREE STATE - 1897 4d rate cover to Bavaria used at SENEKAL. 1897 (AP.17.) 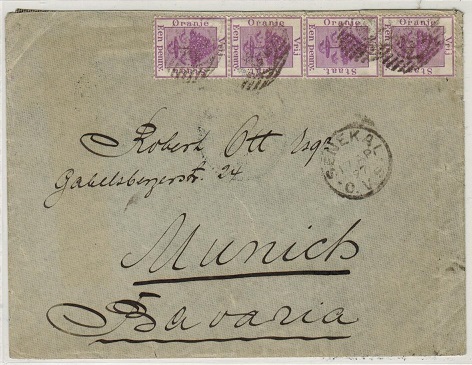 cover addressed to Bavaria bearing 1d violet strip of four tied by duplex cancels with SENEKAL/O.V.S. cds below. ORANGE RIVER COLONY - 1900 OHMS cover to Bloemfontein. 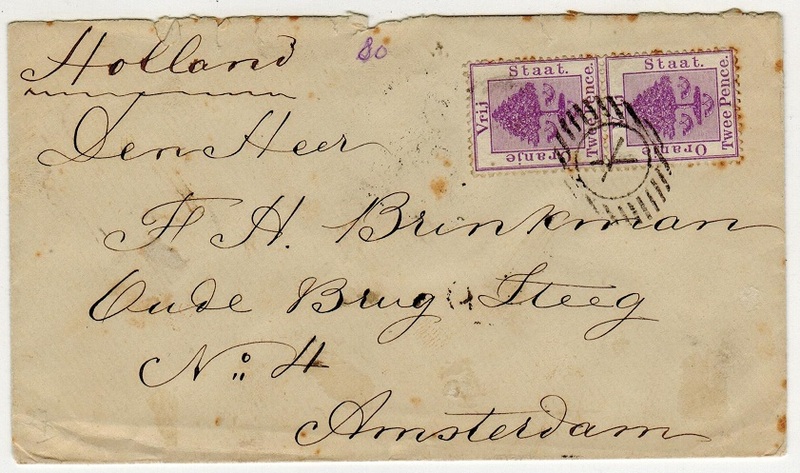 1900 stampless IN DIENST cover addressed to Bloemfontein re instructed with manuscript 'On Her Majesty's Service' and pre-printed at bottom left 'Kantoor Van Den/Oranjevrijstaasche Spoorwegen' (central fold) signed on reverse flap and with BLOEMFONTEIN arrival cds dated AU.11.00. ORANGE RIVER COLONY - 1862 strikes of the 3d handstamp produced by FOURNIER. 1862 FOURNIER strikes of the '3d' handstamp alongside 'Orange River Colony' overprint printed in black on cream card taken from the Fournier forgery handbook. ORANGE RIVER COLONY - 1910 1d rate postcard use to UK used at P.O.TEMPE. 1910 (MAY.16.) 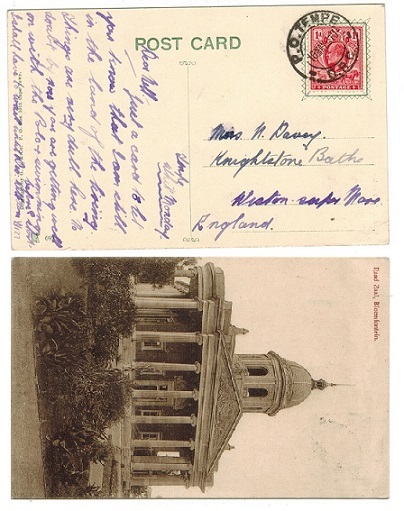 use of picture postcard addressed to UK depicting 'Raad Zaal, Bloemfontein' bearing ORC 1d adhesive tied by P.O.TEMPE/ORC cds. ORANGE RIVER COLONY - 1906 1d rate postcard use to UK used at PHILLIPPOLIS. 1906 (JUN.8.) use of picture postcard addressed to UK depicting "Jagersfontein Diamond Mine- Mechanical Haulage" and bearing 1d adhesive tied by d/r PHILLIPPOLIS/O.R.C. cds. ORANGE RIVER COLONY - 1905 1d rate postcard use to UK used at TEMPE. 1905 (MR.20) use of picture epostcard to UK depicting 'View of Blomfontein' & bearing 1d adhesive tied by the 'skeleton' type TEMPE/ORC cds. ORANGE RIVER COLONY - 1909 1/2d black on 1d carmine PSC to CapeTown used at WINBURG. H&G 39. 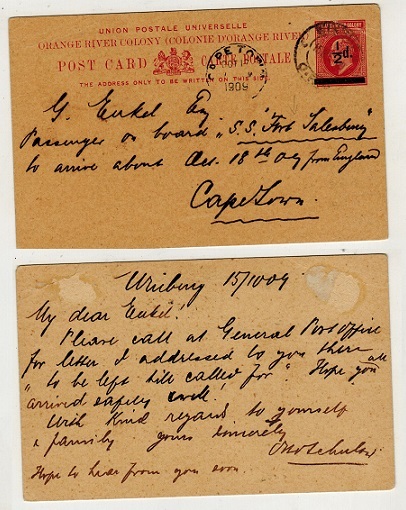 1909 1/2d black on 1d carmine and buff provisional postal stationery postcard addressed to CapeTown (light corner bend) and cancelled by WINBURG cds dated 15.OCT.09. 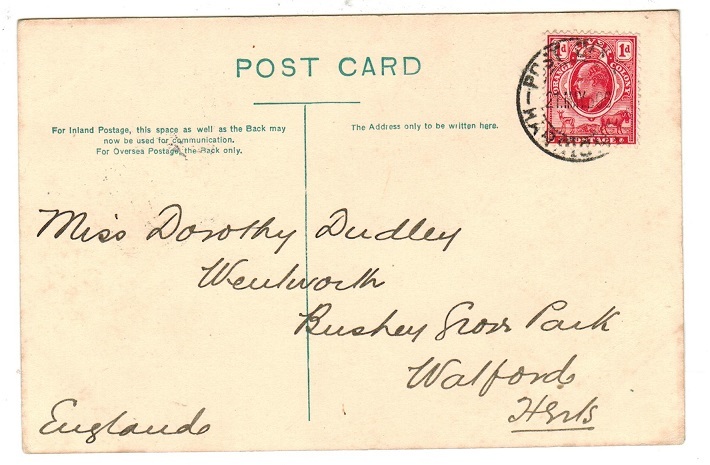 A fine and scarce use of this card with in period of issue. H&G 39. ORANGE RIVER COLONY - 1902 1/2d green PSC to UK used at FRANKFORT. H&G 35. 1902 1/2d green on cream postal stationery postcard addressed to UK nearing additional 1/2d adhesive and cancelled by FRANKFORT/O.R.C. cds's. H&G 35. 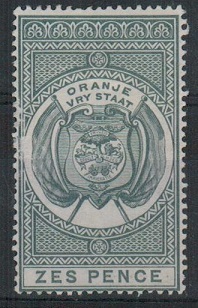 ORANGE FREE STATE - 1884 1d Orange PSC unused. H&G 1. 1884 1d Orange on white postal stationery postcard in fine unused condition. H&G1. ORANGE FREE STATE - 1889 1d Brown & black white PSC unused. H&G 3. 1889 1d Brown & black on white card postal stationery postcard. Fine unused. H&G 3. ORANGE FREE STATE - 1889 1d brown PSC mint with 'W' printed over stamp. H&G 3a. ORANGE RIVER COLONY - 1903 1/2d yellow-green mint with WATERMARK INVERTED. SG 139w. 1903 1/2d yellow-green in fine mint condition showing the variety WATERMARK INVERTED. SG 139w. ORANGE RIVER COLONY - 1903 1d scarlet used showing the variety WATERMARK INVERTED. SG 140a. 1903-04 1d scarlet in fine used condition showing the variety WATERMARK INVERTED. SG 140a. 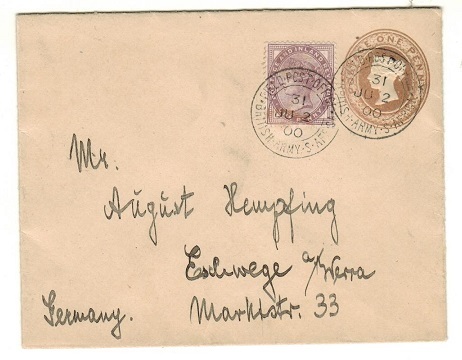 ORANGE RIVER COLONY - 1908 2 1/2d rate cover to Germany used at REDDERSBURG. 1908 (NOV.16.) 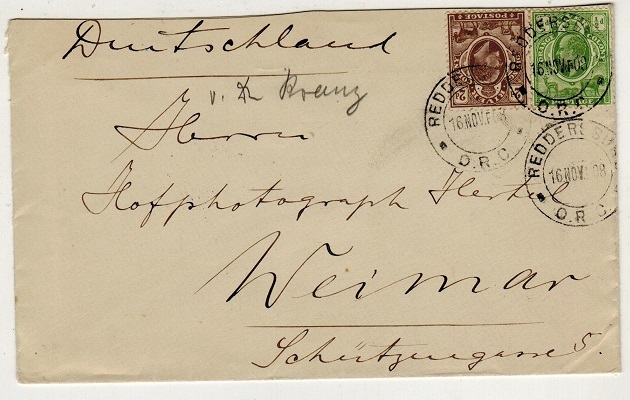 cover addressed to Germany bearing 1/2d and 2d adhesives tied by REDDERSBURG/ O.R.C. cds. WEIMAR arrival b/s. 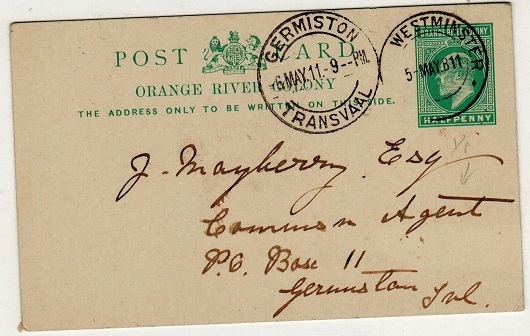 ORANGE RIVER COLONY - 1904 1d carmine PSE to Cape Town used at JAGERSFONTEIN. H&G 2a. 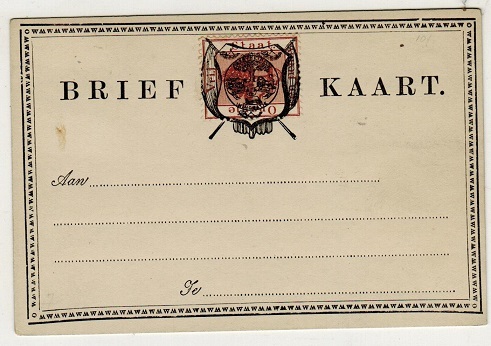 1904 1d carmine on white postal stationery envelope (size d) addressed to Cape Town and cancelled by s/r JAGERSFONTEIN/ORC cds dated 19.JY.04. A nice early use. H&G 2a. ORANGE RIVER COLONY - 1904 1/2d green PSE used locally at FAURESMITH. H&G 1. 1904 1/2d green on white laid paper postal stationery envelope (type a) addressed locally & cancelled by s/r FAURESMITH/ORC cds dated AU.8.04. H&G 1. 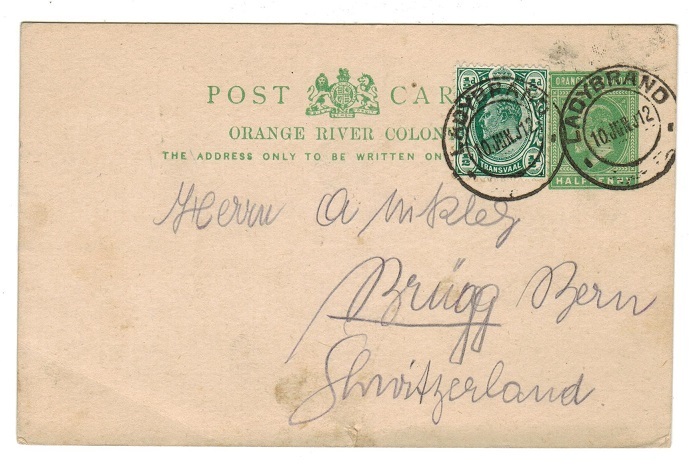 ORANGE RIVER COLONY - 1902 1/2d green PSC uprated to Switzerland and used at LADYBRAND. H&G 40. 1902 1/2d green on cream postal stationery postcard (H&G 40) addressed to Switzerland and bearing the addition of a Transvaal 1/2d (SG 273) both tied LADYBRAND and dated 29.JUN.12. A nice Inter-Provincial use. ORANGE RIVER COLONY - 1902 1/2d green PSC to Transvaal used at WESTMINSTER. H&G 35. 1902 1/2d green on cream postal stationery postcard addressed to Transvaal cancelled by WESTMINSTER cds dated 5.MAY.1911. H&G 35. 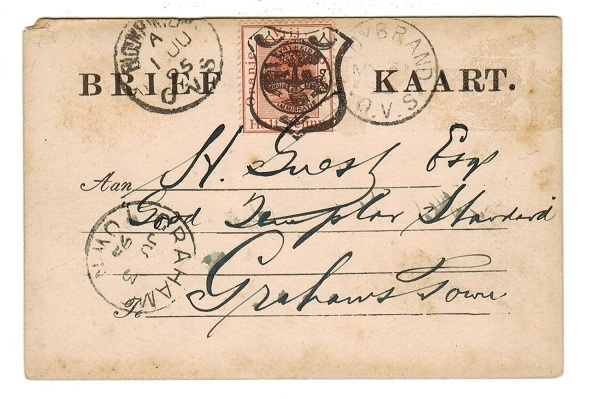 ORANGE FREE STATE - 1890 'OFS/CAPE' combination cover to Germany used at BLOEMFONTEIN. 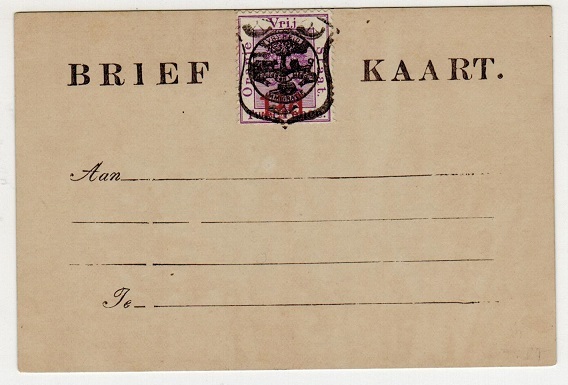 ORANGE FREE STATE - 1889 2d rate cover to Cape Town cancelled '8' duplex at BOSHOF. 1889 (JU.16.) 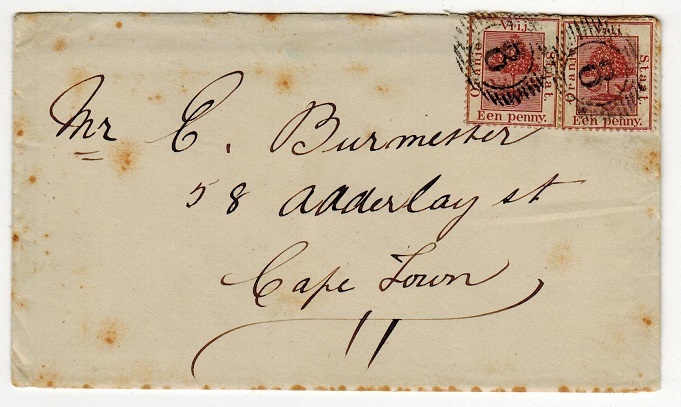 cover addressed to Cape Town bearing 1d brown adhesive pair tied by two '8' barred duplex's with BOSHOF 'proving' backstamp and CAPE TOWN arrival. A few odd tone spots but complete with the original contents. 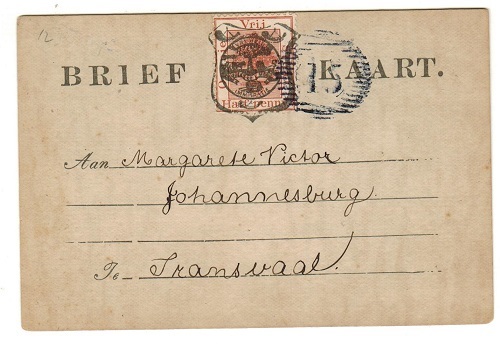 ORANGE FREE STATE - 1890 2d rate cover to Cape Town cancelled by '5' duplex at SMITHFIELD. 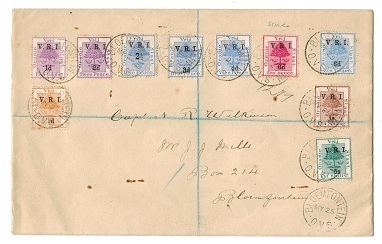 1890 cover addressed to Cape Town bearing 2d violet adhesive tied by '5' barred duplex with GPO/CAPETOWN arrival b/s. 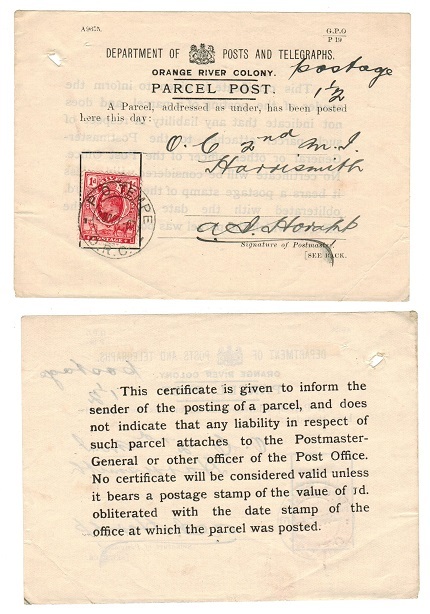 The envelope has commercial pre-printed origin on reverse side proving '5' to be from Smithfield and is complete with the original contents. 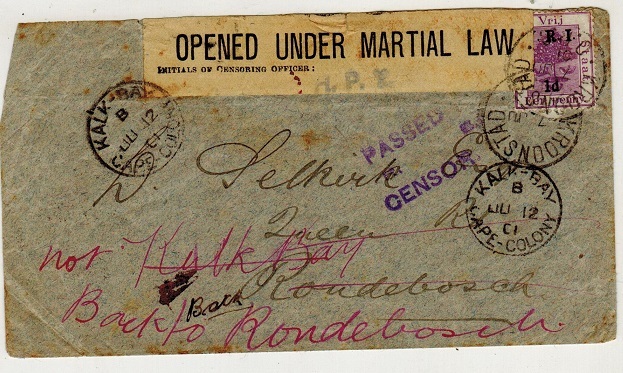 ORANGE FREE STATE - 1901 Boer War 'Opened Under Martial Law' censor cover used at KROONSTAD. 1901 (AP.19.) 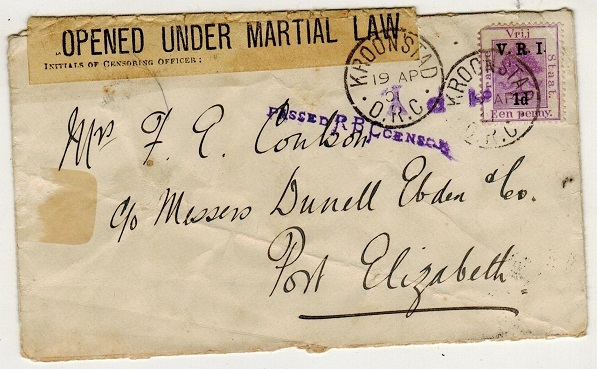 cover addressed to Port Elizabeth in the Cape bearing VRI 1d on 1d tied by KROONSTAD/ORC cds with black on pale yellow OPENED UNDER MARTIAL LAW censor label at top. Violet H.P.Y. censor strike applied and violet s/l PASSED R.B. CENSOR h/s. 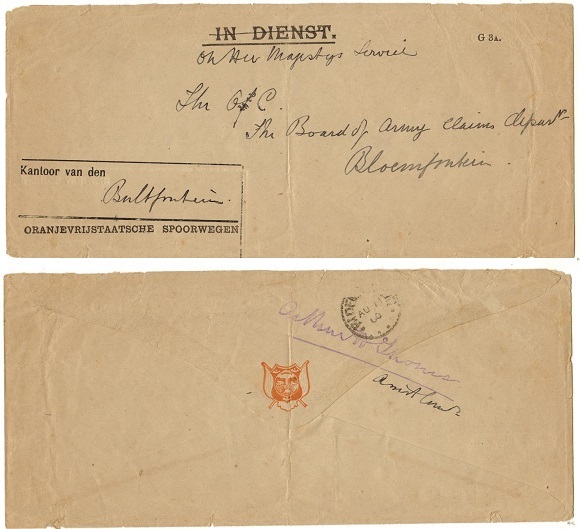 1901 (JU.7) cover to Rondesbosch bearing VRI 1d on 1d purple surcharge cancelled KROONSTAD cds with black on buff OPENED UNDER MARTIAL LAW label at top with H.P.Y. h/s. KALK-BAY/CAPE COLONY arrival cds with violet PASSED CENSOR h/s. ORANGE FREE STATE - 1884 1d orange PSC uprated to Germany used from BETHANIE. H&G 1. 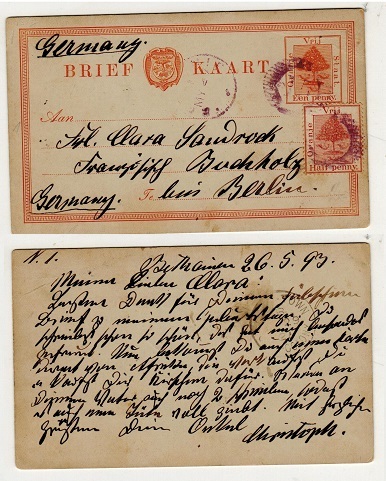 1884 1d orange on cream postal stationery postcard addressed to Germany uprated with additional 1/2d adhesive and cancelled by violet '15' duplex with light BETHANIE cds at left dated MR.27.93. H&G 1. 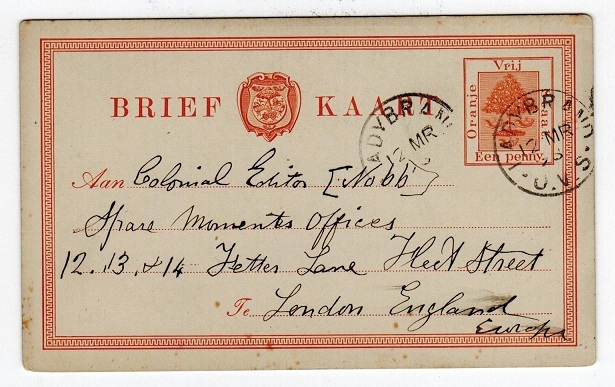 ORANGE RIVER COLONY - 1901 TELEGRAM envelope to UK used at ARMY P.O.43. 1901 (JY.19.) 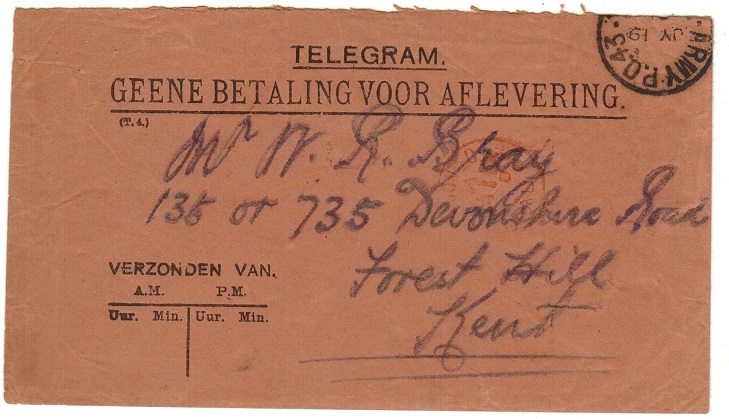 use of black on salmon TELEGRAM/GEENE BETALING VOOR AFLEVERING envelope addressed to UK cancelled by large part of the ARMY P.O.43/S.AFRICA cancel from the advanced depot stationed at Bloemfontein. A scarce telegram from ORC. ORANGE RIVER COLONY - 1901 reply section of the 1d+1d PSRC with censor use at KROONSTAD. H&G 34. 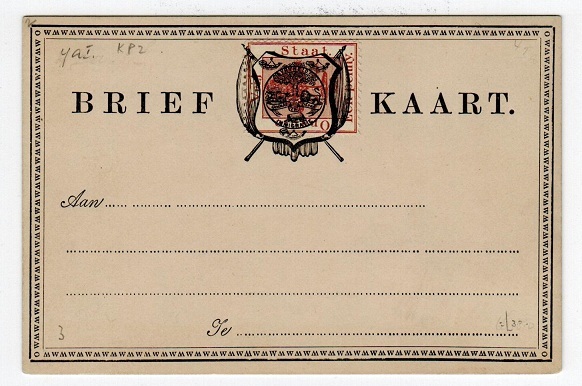 1901 reply section of the 1d+1d brown on buff 'Cape Of Good Hope' postal stationery reply type postcard overprinted ORANGE/RIVER/COLONY addressed to Austria and cancelled by KROONSTAD/O.R.C. cds dated NO.8.01. Struck by 'N.P.I.' censor mark at left in blue and with black two lined PASSED CENSOR/OW NOV 8 strike. A rare use of this reply section card. H&G 34. ORANGE RIVER COLONY - 1902 'Soldiers' letter to Cape used at FIELD PO.44 at Heilbron. 1902 (JU.27.) 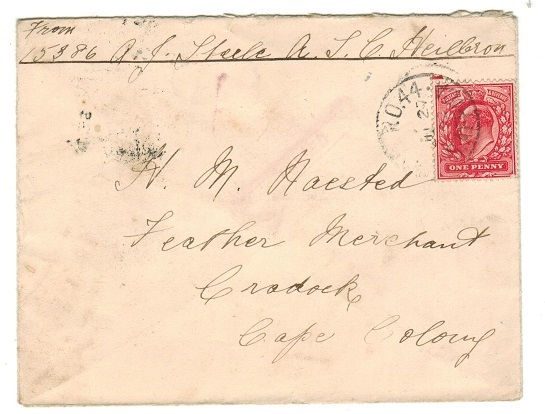 soldiers cover addressed to Cape Colony bearing GB Edward VII 1d red adhesive tied by FIELD P.O.44/S.AFRICA used by troops stationed at Heilbron and with ARMY POST OFFICE/BLOEMFONTEIN transit b/s. ORANGE RIVER COLONY - 1901 reply section of the 1d+1d PSRC used at WINBURG. H&G 34. 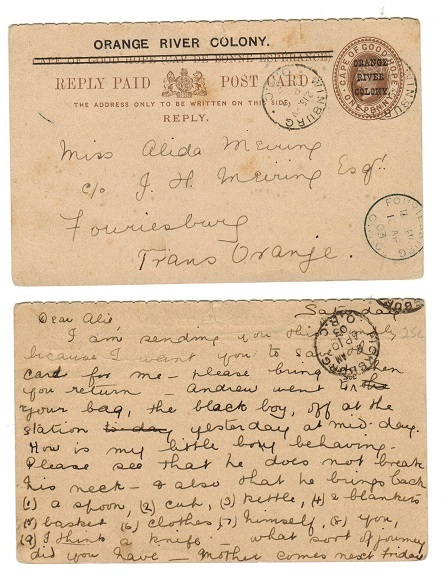 1901 reply use of the 1d+1d brown on cream postal stationery postcard addressed to Fouriesburg cancelled by WINBURG/ORC cds with FOURIESBURG arrival below dated 10.AP.03. Scarce. H&G 34. ORANGE FREE STATE - 1891 1/2d brown FORMULA PSC uprated with 1d at SMITHFIELDS. H&G 6d. 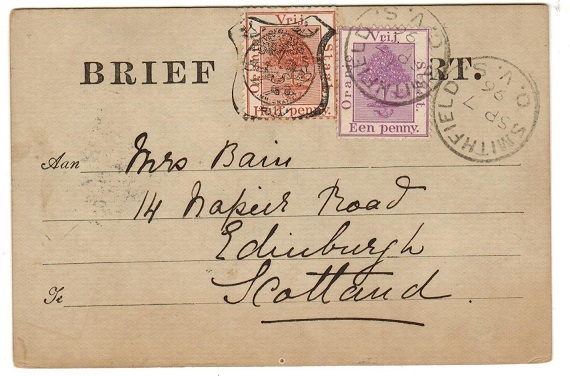 1891 1/2d brown adhesive on FORMULA ststionery postcard addressed to Scotland (long message) bearing additional 1d tied SMITHFIELD/OVS and dated SP.7.96. H&G 6d. 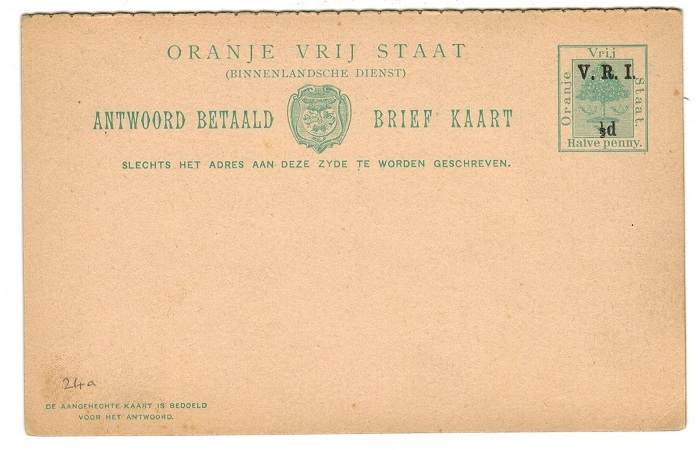 ORANGE FREE STATE - 1898 20/- olive green POSTAL ORDER. H&G 10. 1898 20/- olive green on cream POSTAL ORDER cancelled by squared circle FICKSBURG/OVS cds and cashed in Natal with ESTCOURT/NATAL dated JU.1.98. Bears Natal 1d strip of three on the reverse side cancelled by additional ESTCORT cds. Light vertical bends. H&G 10. 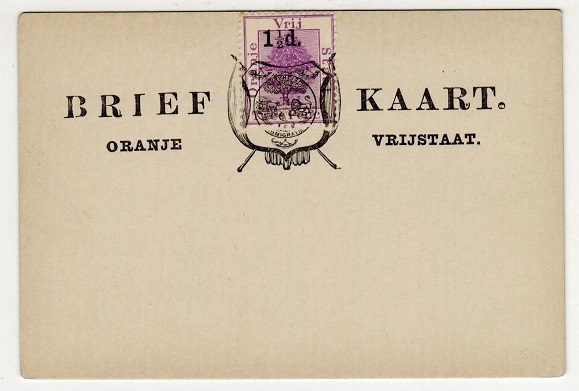 ORANGE FREE STATE - 1898 10/- violet POSTAL ORDER. H&G 6. 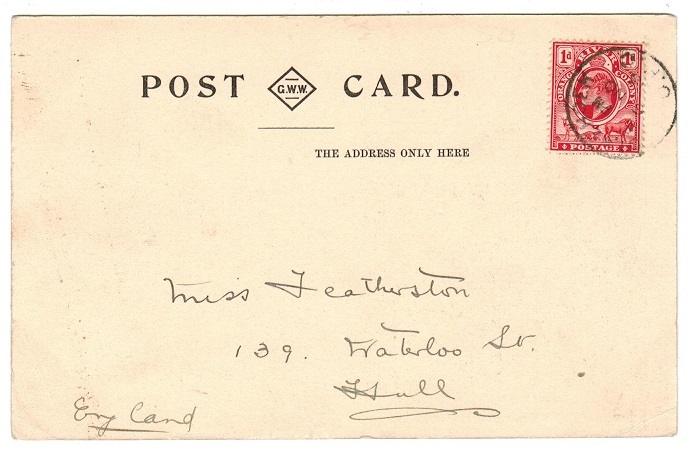 1898 10/- violet on cream POSTAL ORDER cancelled WINBURG/OVS. cds and cashed at HEIDELBURG and dated cds dated JY.20.99. Cape 1d adhesive pair on reverse side cancelled by additional HEIDELBURG cds. Official punch hole at left. Light vertical bends. H&G 6. 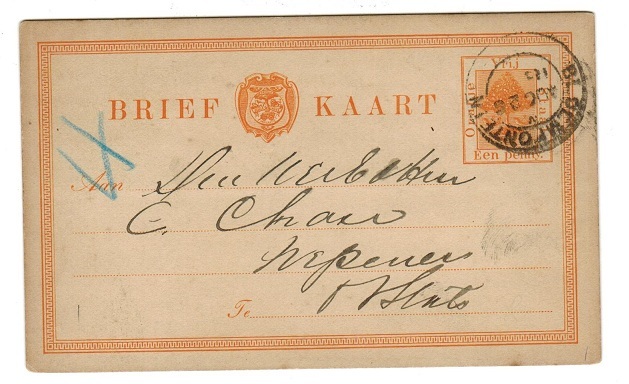 ORANGE FREE STATE - 1898 5/- red brown POSTAL ORDER. H&G 4. 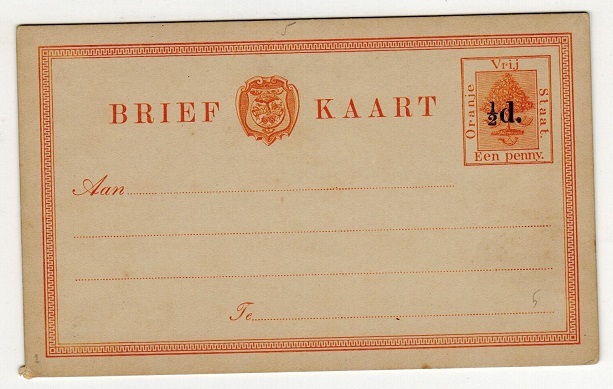 1898 5/- red brown on cream POSTAL ORDER cancelled JACOBSDAL/O.V.S. cds and cashed and cashed in Cape Town with M.O.O. /CAPE TOWN cds dated DE.28.98. Cape 1d adhesive on reverse side cancelled by Money Order Office cancel. Light vertical bends. H&G 4. ORANGE FREE STATE - 1895 1 1/2d on 2d violet PSC unused. H&G 15. 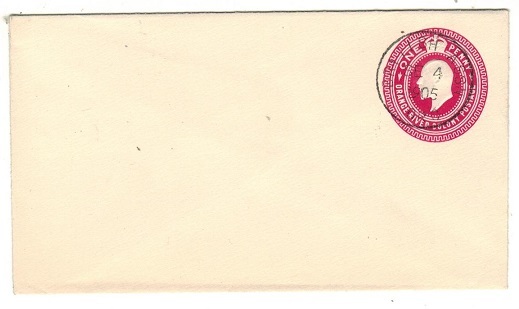 1895 1 1/2d red on 2d violet on white postal stationery postcard in fine unused condition. H&G 15. ORANGE FREE STATE - 1895 1/2d on 1/2d brown PSC unused. H&G 14. 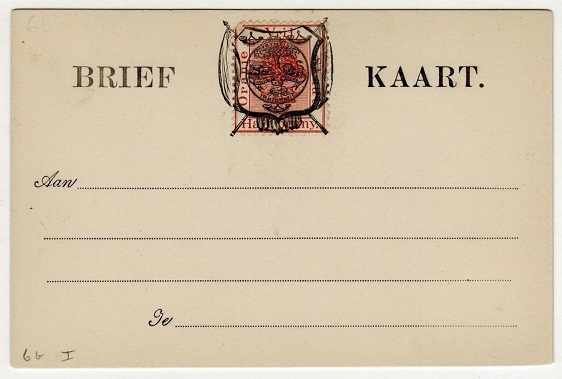 1895 1/2d Black on 1/2d Brown on white postal stationery postcard in fine unused condition. H&G 14. ORANGE FREE STATE - 1891 1 1/2d brown and black PSC unused. H&G 6b. 1891 1/2d brown and black on white postal stationery postcard in unused condition. H&G 6b. ORANGE FREE STATE - 1893 1 1/2d on 2d violet PSC unused. H&G 11. 1893 1 1/2d black on 2d violet on white postal stationery postcard. Fine unused. H&G 11. ORANGE FREE STATE - 1891 1/2d brown and black PSC unused. H&G 6a. 1891 1/2d Brown & black on white postal stationery postcard. Fine unused. H&G 6a. 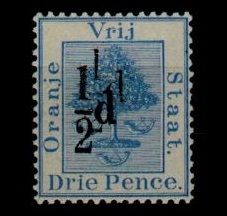 ORANGE FREE STATE - 1892 1d on 3d blue PSC unused. H&G 7. 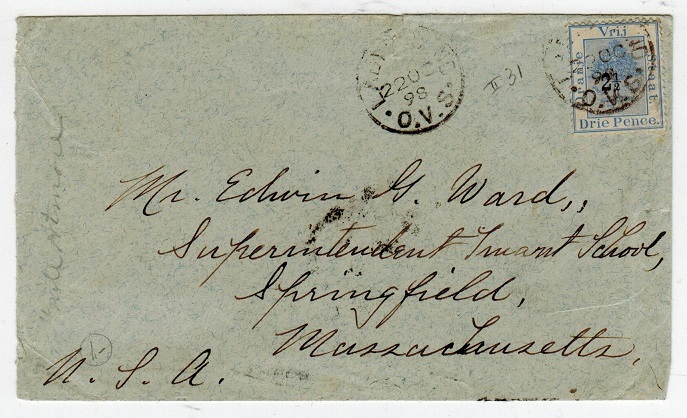 1892 1d black on 3d blue on white postal stationery postcard. Fine unused. H&G 7. ORANGE FREE STATE - 1891 1/2d brown on white PSC unused. H&G 6. 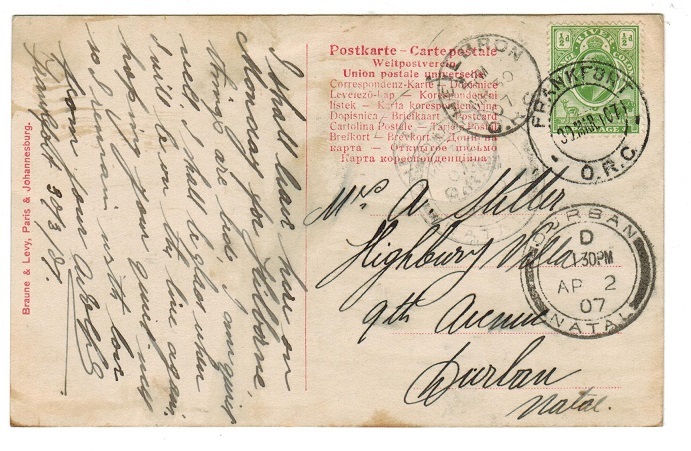 1891 1/2d Brown & black on white postal stationery postcard. Fine unused. H&G 6. ORANGE FREE STATE - 1891 1/2d on 1d orange PSC unused. H&G 5. 1891 1/2d Black on 1d Orange on white postal stationery postcard. Fine unused. H&G 5. ORANGE RIVER COLONY - 1907 use of official crested PARCEL POST receipt at TEMPE. 1907 (OCT.28.) use of (GPO/P.19-A9675) PARCEL POST receipt bearing 1d adhesive tied by P.O.TEMPE/O.R.C. cds. A scarce piece of official stationery so used. ORANGE FREE STATE - 1882 6d grey fiscal mint. SG F1. 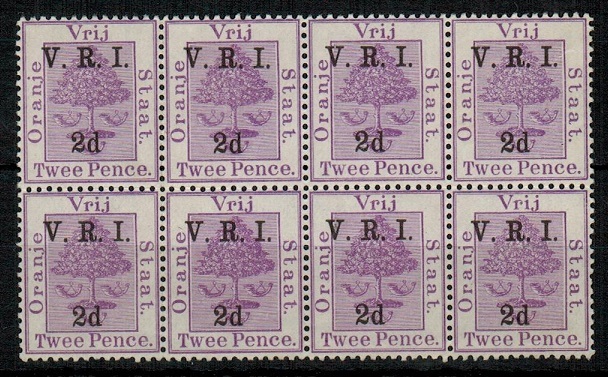 ORANGE FREE STATE - 1900 2d on 2d bright violet 'VRI' mint block of 8. SG 103. 1900 2d on 2d bright violet 'VRI' adhesive in a fine mint block of eight. SG 103. 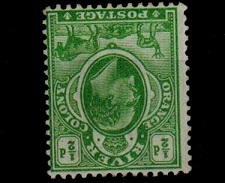 ORANGE RIVER COLONY - 1900 1/2d green U/M marginal pair with NO STOP variety. SG 133a. 1900 1/2d green in a fine unmounted mint left hand marginal pair with one stamp showing the NO STOP AFTER COLONY. SG 133a. 1896 HALF PENNY on 3d ultramarine in a fine unmounted mint marginal pair with one stamp showing the MISSING STOP AFTER PENNY. SG 78. 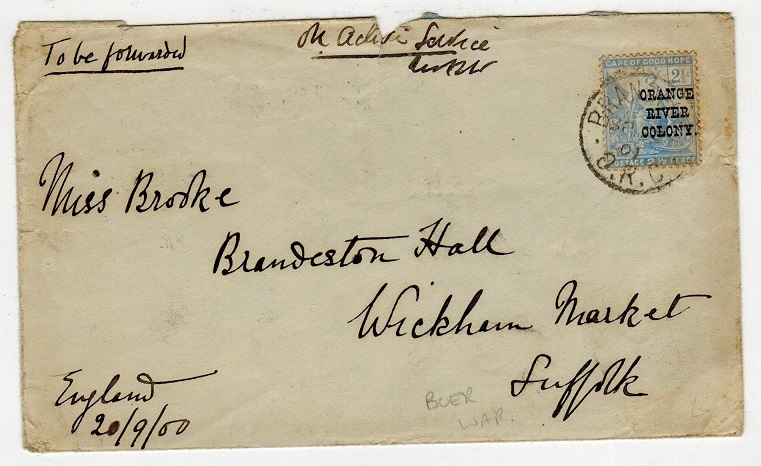 ORANGE RIVER COLONY - 1900 Stampless 'Boer War' cover to UK used at BLOEMFONTEIN. 1900 (JY.2.) 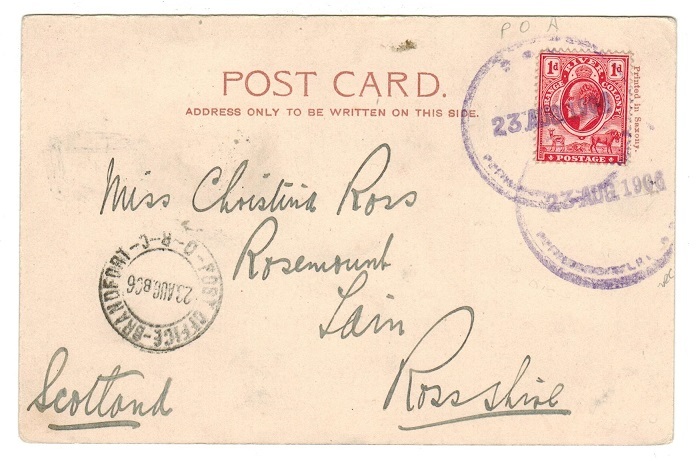 stampless cover addressed to Scotland marked 'No Stamps Available' cancelled by d/r FIELD POST OFFICE/BRITISH ARMY S.AFRICA cds with '24' coding slug used by troops at Bloemfontein. Light central fold and red LONDON/PAID arrival cds on front. ORANGE RIVER COLONY - 1902 1/2d and 1d PSC cto'd by '266' duplex and MISSION SIDING cds's. 1902 1/2d green and 1d carmine postal stationery postcards (H&G 35+36) both unaddressed and cancelled to order by scarce '266' numeral duplex's and with MISSION SIDING 'proving' cds's below dated JY.28.04. An interesting and scarce pair. 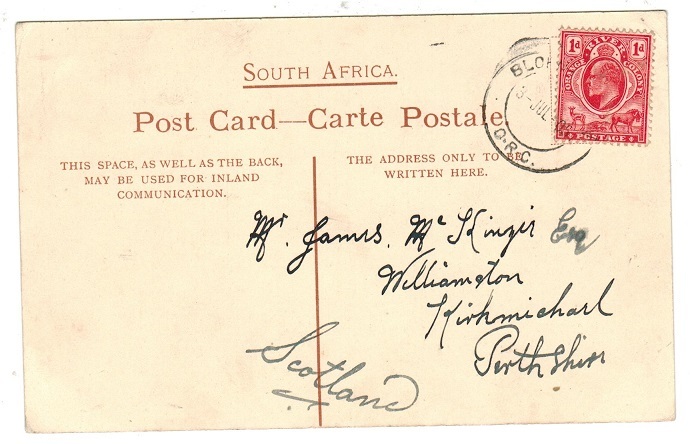 ORANGE RIVER COLONY - 1900 1/2d on 1/2d censored PSC to Johannesburg from HARRISMITH. H&G 26. 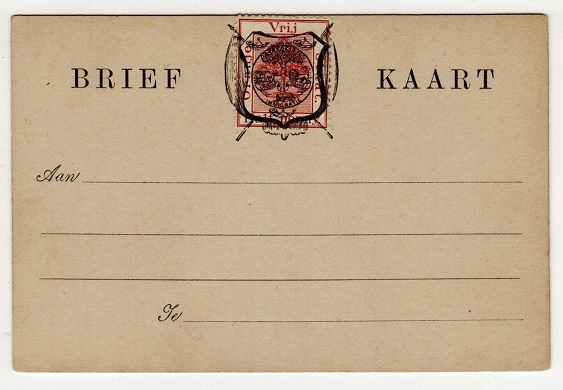 1900 1/2d on 1/2d carmine on cream postal stationery postcard to Johannesburg & cancelled by HARRISMITH cds dated FE.22.02 with oval PASSED PRESS CENSOR/JOHANNESBURG h/s. H&G 26. 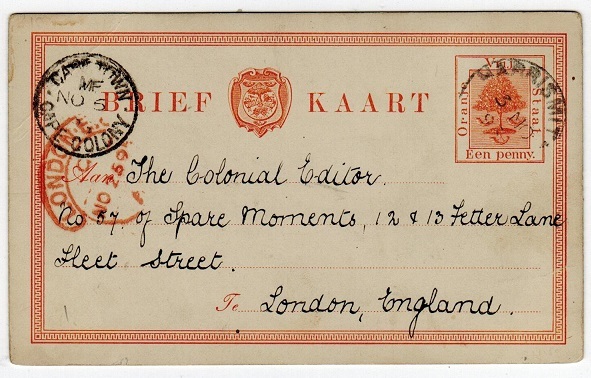 ORANGE RIVER COLONY - 1901 'On Active Service' cover to UK used during the Boer War. 1901 (SP.23.) cover addressed to UK marked in manuscript 'On Active Service' and bearing Cape 2 1/2d overprint (SG 135) tied by s/r BLANDFORT/ORC cds. 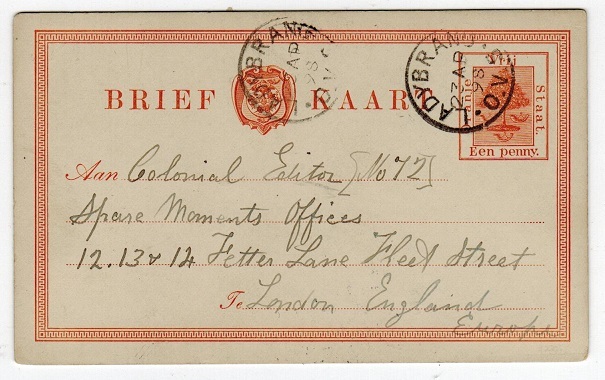 ORANGE RIVER COLONY - 1902 1d rate soldiers cover to UK from KROONSTAD used during the Boer War. 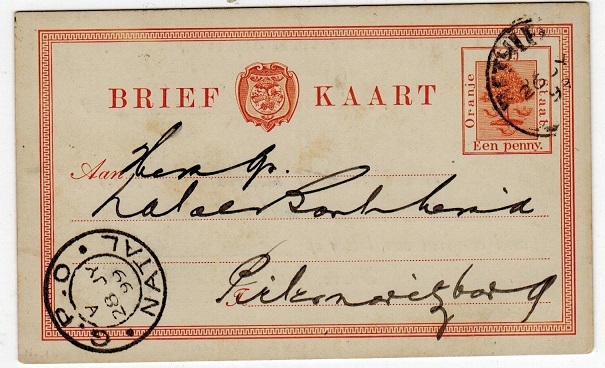 1902 (JY.29) soldiers envelope addressed to UK bearing 'GB' Edward VII 1d adhesive tied by neat s/r KROONSTAD/O.R.C. cds. ORANGE RIVER COLONY - 1904 postcard to Johannesburg used at POST OFFICE AGENCY. 1904 (AUG.23.) 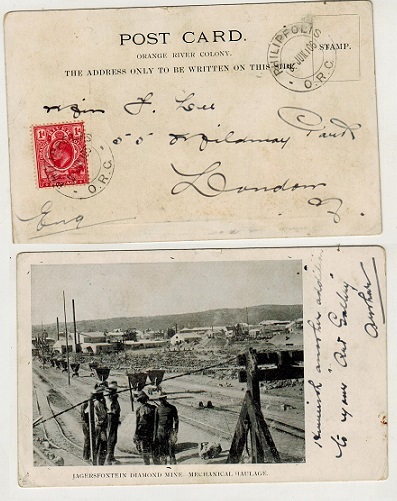 use of picture postcard addressed to UK depicting 'Johannesburg from Wanderers View' bearing 1d adhesive tied by scarce (but unclear) rubber P.O.A. cancel in violet. POST OFFICE BRANDFORT/ORC transit cds at left. 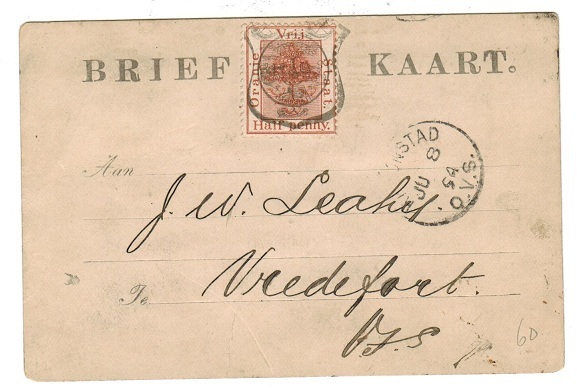 ORANGE RIVER COLONY - 1902 1d PSC uprated to with Transvaal 1/2d at LADYBRAND. H&G 40. 1902 1/2d green on cream postal stationery postcard (H&G 40) addressed to Switzerland and bearing the addition of a Transvaal 1/2d (SG 273) both tied LADYBRAND and dated 10.JUN.12. A nice Inter-Provincial use. 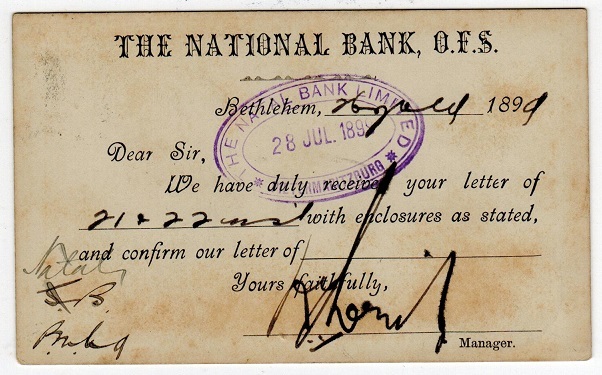 ORANGE RIVER COLONY - 1902 4d RPSE to UK uprated with 1d and used at THABA'NCHU. H&G 1. 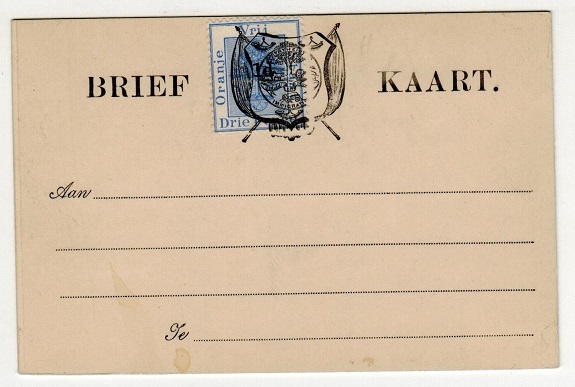 1902 4d blue on cream registered postal stationery envelope (size F) addressed to UK bearing additional 1d adhesive and cancelled by d/r THABA ' NCHU/O.R.C. cds dated 11.AUG.06. H&G 1. ORANGE RIVER COLONY - 1911 1d rate illustrated cover to UK used at SPRINGFONTEIN. 1911 (SEP.25.) 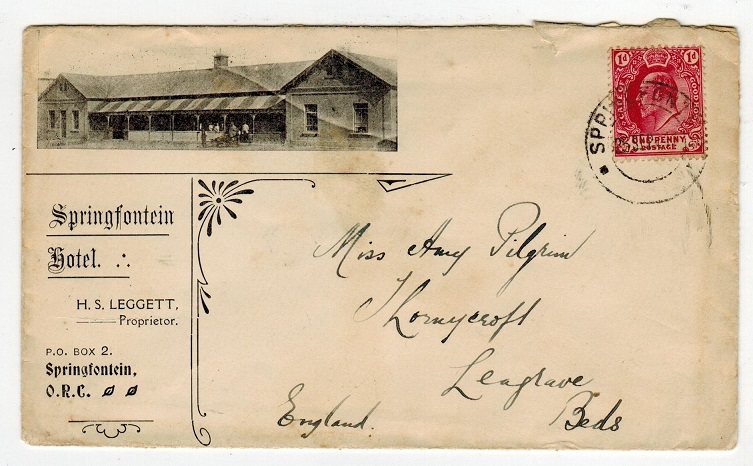 illustrated 'Springfield Hotel' cover addressed to UK bearing Cape Of Good Hope 1d adhesive tied by d/r SPRINGFONTEIN cds. A fine Inter-Provincial use. ORANGE RIVER COLONY - 1909 postcard to UK used at KINGS HILL. 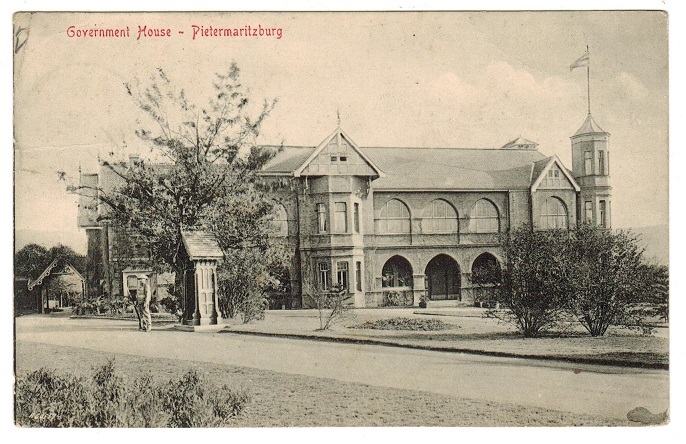 1909 (MAR.13) use of picture postcard to UK depicting 'Government House, Pietermaritzburg' & bearing 1d adhesive tied by d/r KINGS HILL/O.R.C. cds. A rare postmarking. 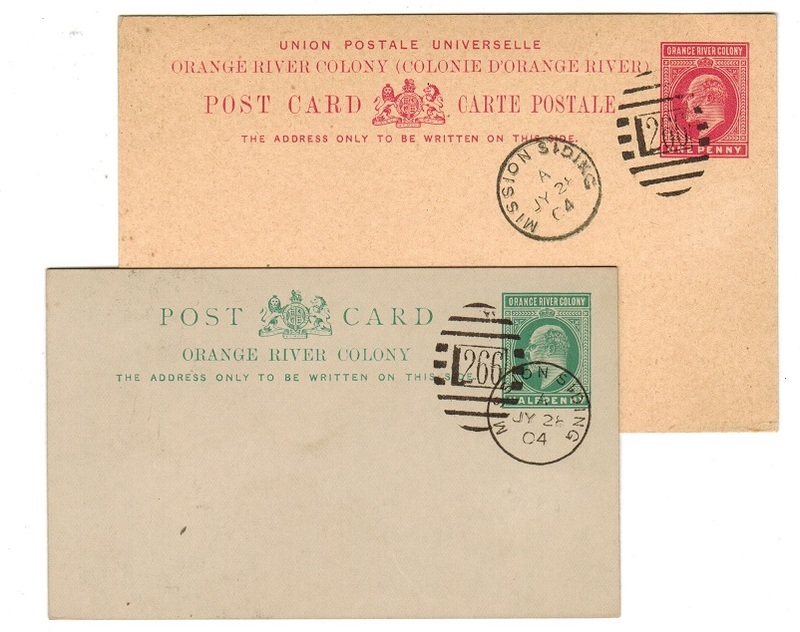 ORANGE RIVER COLONY - 1907 postcard to Durban used at FRANKFORT. 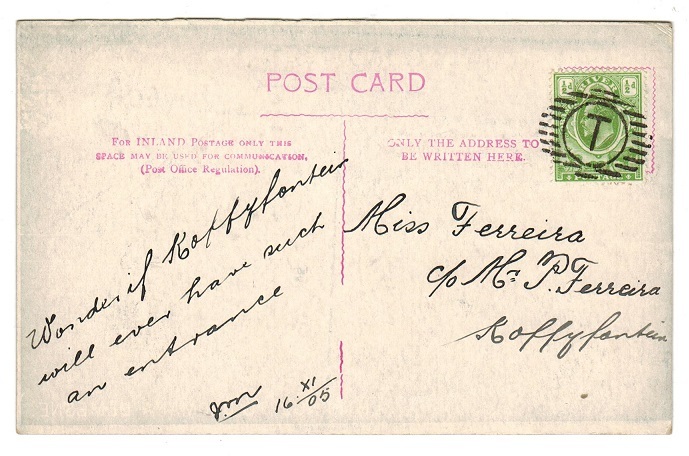 1907 (MAR.30) use of postcard addressed to Durban bearing 1/2d (SG148) tied by FRANKFORT/ O.R.C. cds. HEILBRON/ORC transit & DURBAN/NATAL arrival. 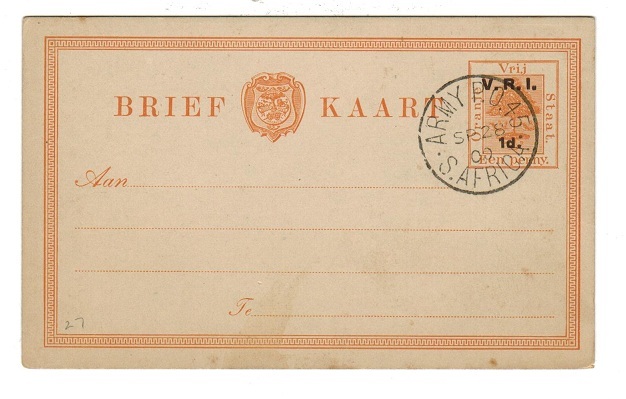 ORANGE RIVER COLONY - 1905 locally used postcard with 'T' strike used at KOFFYFONTEIN. 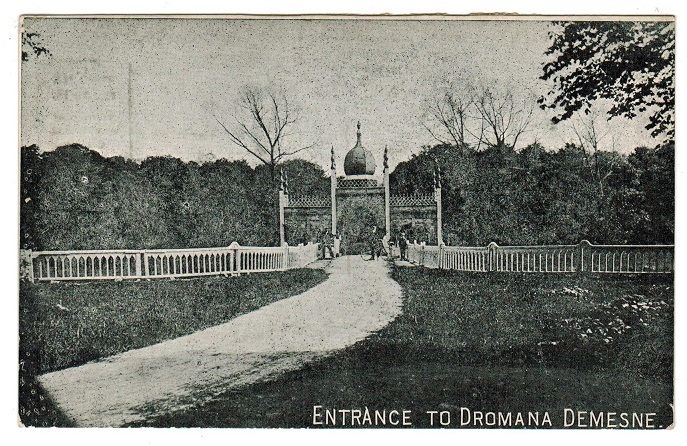 1905 use of picture postcard addressed locally depicting 'Entrance to Dromana Demesne' and bearing 1/2d green adhesive tied by circled (barred) 'T' cancellator of Koffyfontein. ORANGE RIVER COLONY - 1905 postcard to UK used at WOLVENHOEK. 1905 (NO.6.) 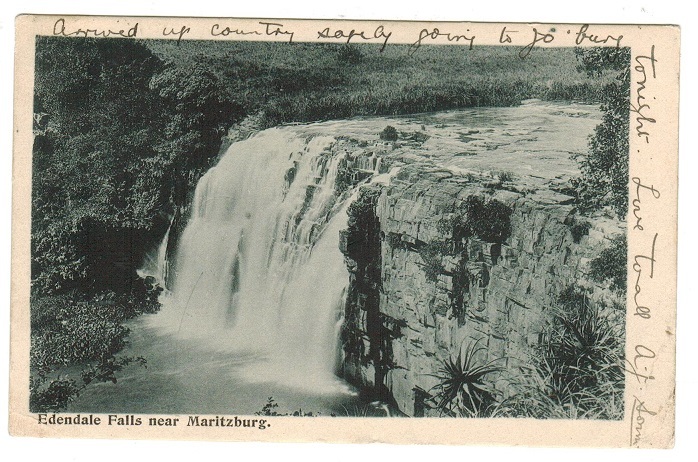 use of picture postcard addressed to UK depicting 'Edendale Falls near Maritzburg' bearing 1d adhesive tied by s/r WOLVENHOEK /O.R.C. cds. ORANGE RIVER COLONY - 1905 postcard to UK used at PARYS. 1905 (JA.3.) 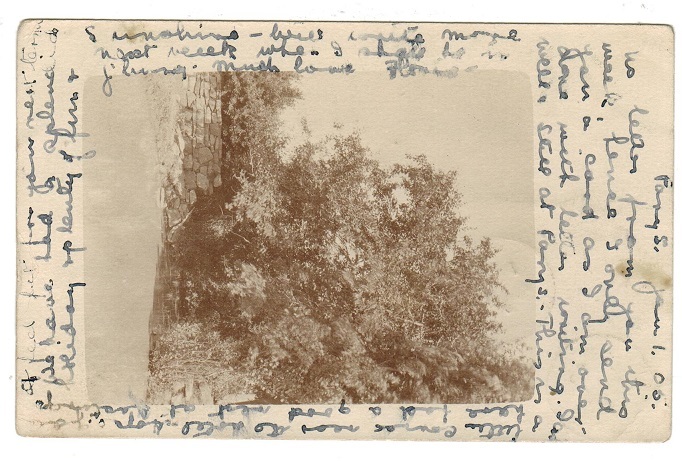 use of picture postcard addressed to UK depicting real photo inset on reverse of 'river scene' bearing ORC 1d adhesive tied by PARYS/ORC s/r cds. 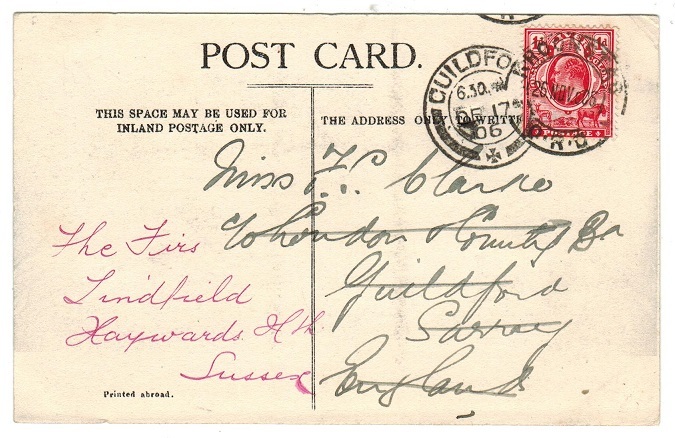 ORANGE FREE STATE - 1900 1d VRI on cover to UK used at FICKSBURG. 1900 (JU.6.) cover addressed to UK bearing VRI 1d on 1d violet adhesive tied by light FICKSBURG/OVS cds. ORANGE FREE STATE - 1896 1/2d on 3d use on cover to UK used at LADYBRAND. 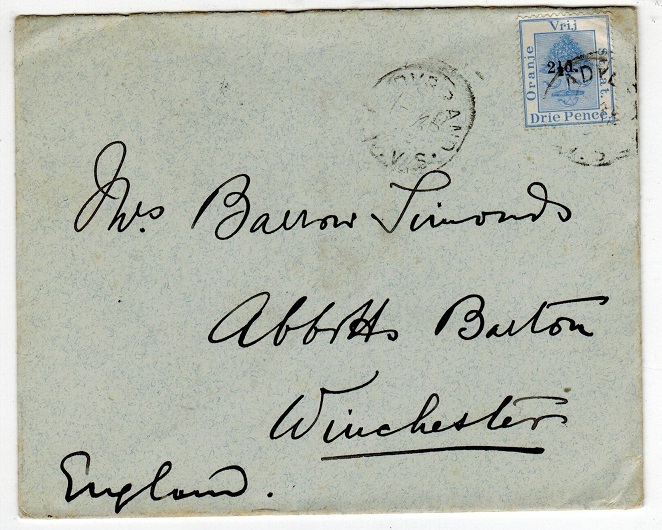 1896 cover addressed to UK bearing 2 1/2d on 3d ultramarine adhesive (SG 67) tied by light LADY BRAND/O.V.S. cds with squared circle CAPE TOWN/CAPE COLONY transit b/s. ORANGE FREE STATE - 1898 2 1/2d on 3d use on cover to USA used at LADYBRAND. 1898 (OC.22.) 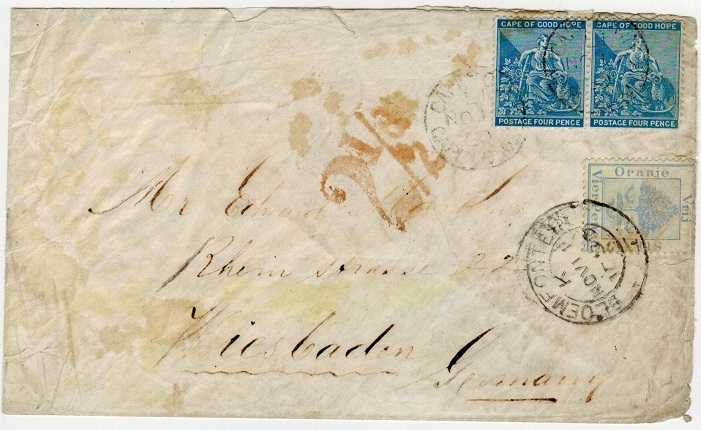 cover addressed to USA bearing 2 1/2d black on 3d ultramarine adhesive (SG 83) tied by light LADYBRAND/O.V.S. cds. ORANGE RIVER COLONY - 1910 postcard to UK used at P.O.TEMPE. 1910 (JAN.3.) 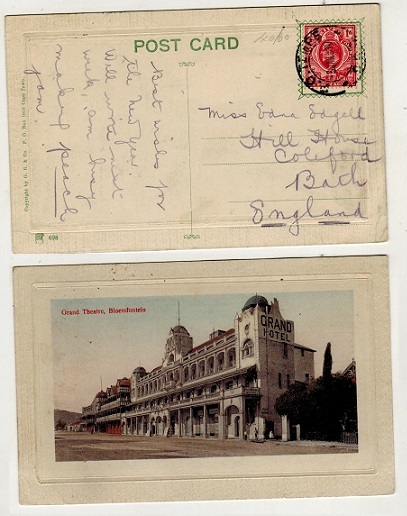 use of picture postcard addressed to UK depicting 'Grand Theatre, Bloemfontein' and bearing ORC 1d adhesive tied by P.O.TEMPE/ORC cds. 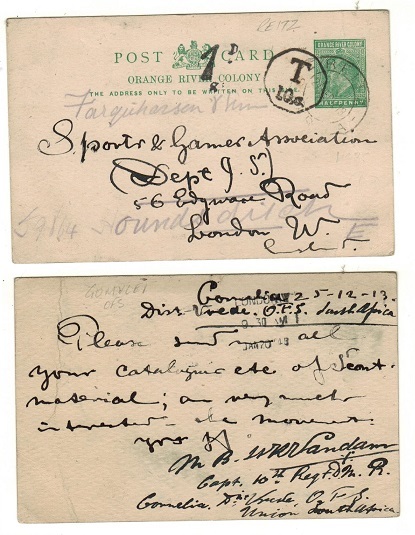 ORANGE RIVER COLONY - 1907 1/d strip of three cancelled by violet PARCLE/BLOEMFONTEIN cds. 1907 (JUN.21.) use of a fine vertical marginal strip of three of the Edw 1/2d green adhesive cancelled by large part of the scarce violet d/r PARCELS/BLOEMFONTEIN cancel. 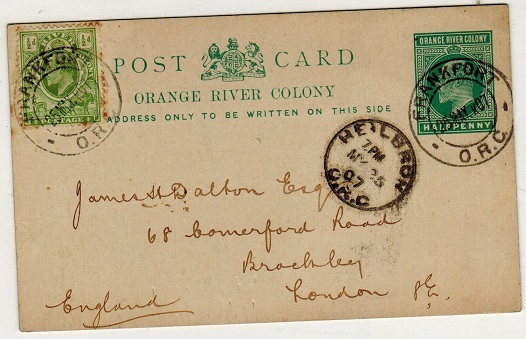 ORANGE RIVER COLONY - 1906 postcard to UK used at POST OFFICE/HARRISMITH. 1906 (MY.21.) 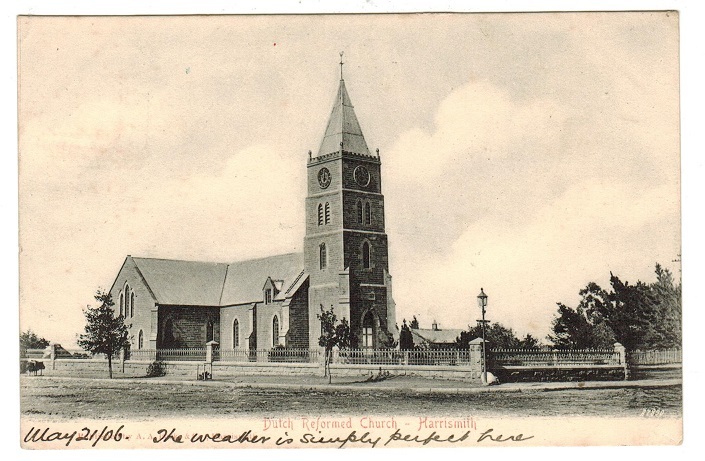 use of picture postcard addressed to UK depicting 'Dutch Reformed Church-Harrismith' bearing ORC 1d adhesive tied POST OFFICE/HARRISMITH cds. ORANGE RIVER COLONY - 1906 postcard to UK used at KROONSTADT. 1906 (NOV.26.) 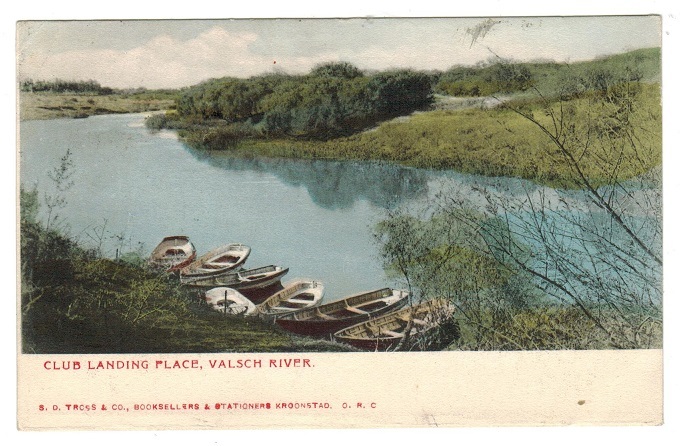 use of picture postcard addressed to UK depicting 'Club Landing Place, Valsch River' bearing ORC 1d adhesive tied KROONSTAD/ORC. 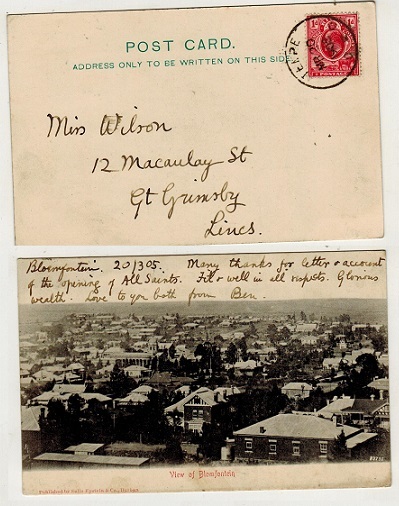 ORANGE RIVER COLONY - 1905 postcard to UK used at WINBURG. 1905 (JUN.10) use of picture p'card addressed to UK depicting 'Ostriches' & bearing 1/2d adhesive tied by d/r WINBURG/ORC cds. ORANGE RIVER COLONY - 1905 postcard to UK used at BLOEMFONTEIN. 1905 (JUL.3.) 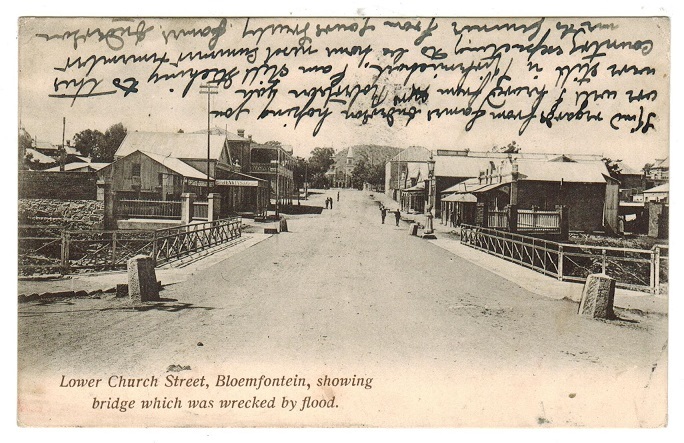 use of picture postcard addressed to UK depicting 'Lower Church Street Bloemfontein- bridge which was wrecked by flood' bearing ORC 1d adhesive tied BLOEMFONTEIN/ORC. 1905 (JUL.3.) 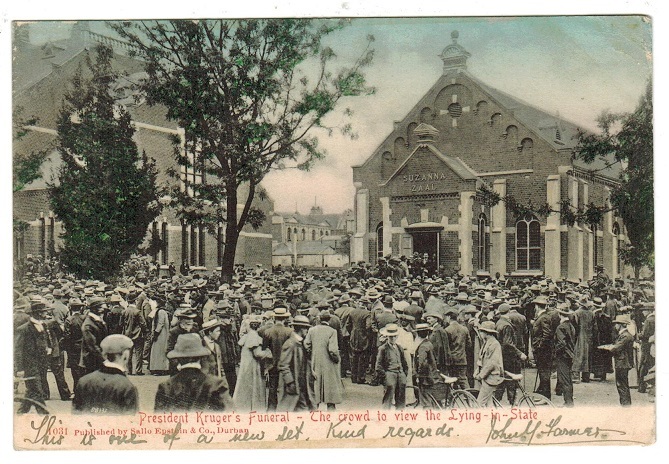 use of picture postcard addressed to UK depicting 'President Krugers Funeral-The crowd to view the lying in state' bearing ORC 1d adhesive tied BLOEMFONTEIN/ORC. 1910 (Circa) FORNIER FORGERY proof strikes of the '3d' overprint. ORANGE RIVER COLONY - 1910 LEGISLATIVE COUNCIL official unused envelope and paper. 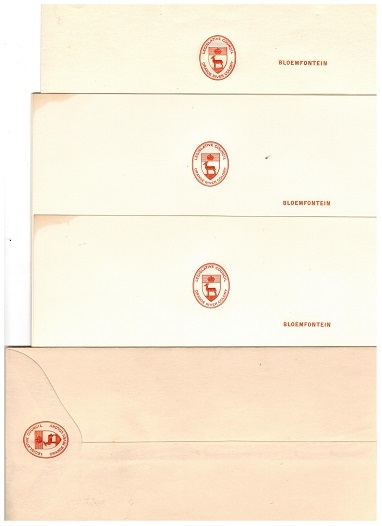 1910 (circa) official unused envelope (size H2) crested with orange LEGISLATIVE COUNCIL/ORANGE RIVER COLONY shield applied on flap and complete with three similar crested pieces of writing paper additionally embossed 'Bloemfontein'. (4 items). ORANGE FREE STATE - 1900 (MY.25.) registered local cover with 'VRI' adhesives to 5/-. 1900 (MY.25.) 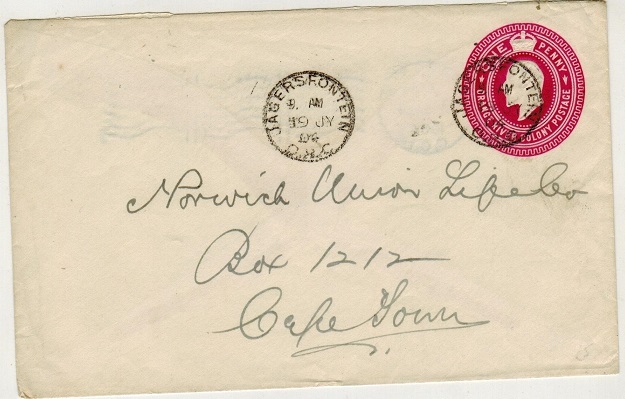 registered cover addressed locally (Ex reverse flap) to Captain R Wilkinson bearing the 1900 V.R.I. surcharge series from 1/2d on 1/2d to 1/- on 1/- (normal stops) and including the scarce 6d on 6d bright carmine adhesive (SG 108) plus the raised stops 5/- on 5/- each tied by BLOEMFONTEIN/O.V.S. cds's. 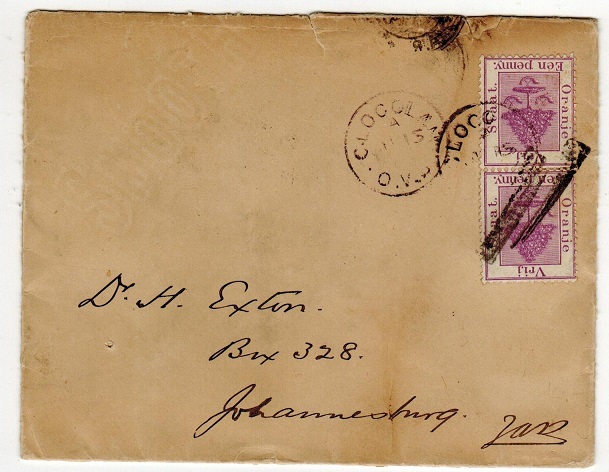 ORANGE RIVER COLONY - 1911 mixed Inter Provincial use cover from BLOEMFONTEIN. 1911 (JUN.12.) 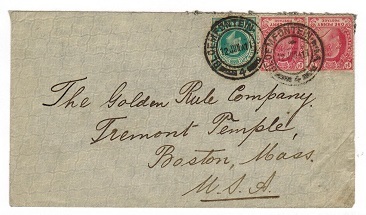 cover addressed to USA bearing Natal 1/2d and Cape 1d pair tied by BLOEMFONTEIN/4 cds. A fine mixed Inter-Provincial use. 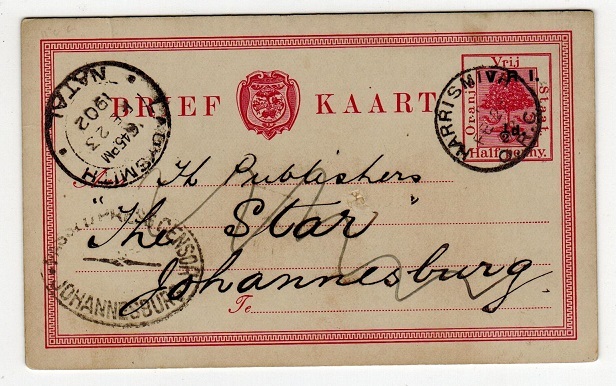 ORANGE FREE STATE - 1884 1d PSC used at BETHLEHEM. H&G 1. 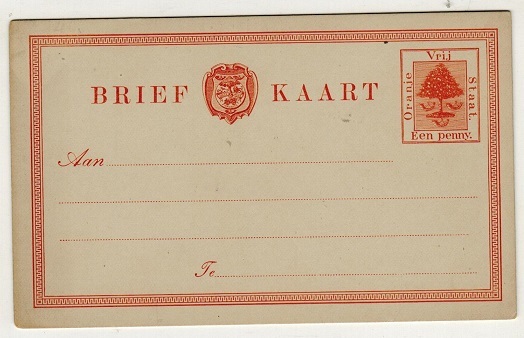 1884 1d Orange on white postal stationery postcard addressed locally & cancelled BETHLEHEM & dated 26.JY.99. H&G1. ORANGE FREE STATE - 1884 1d PSC used at HARRISMITH. H&G 1. 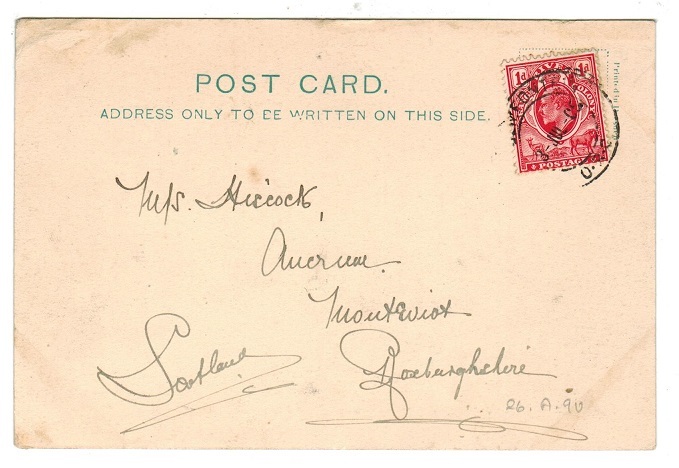 1884 1d Orange on white postal stationery postcard addressed to UK (corner bend) cancelled HARRISMITH cds dated 3.NO.93. H&G1. ORANGE FREE STATE - 1884 1d PSC used from LADYBRAND. H&G 1. 1884 1d Orange on white postal stationery postcard addressed to UK cancelled LADYBRAND /O.V.S. dated 23.AP.98. H&G 1. 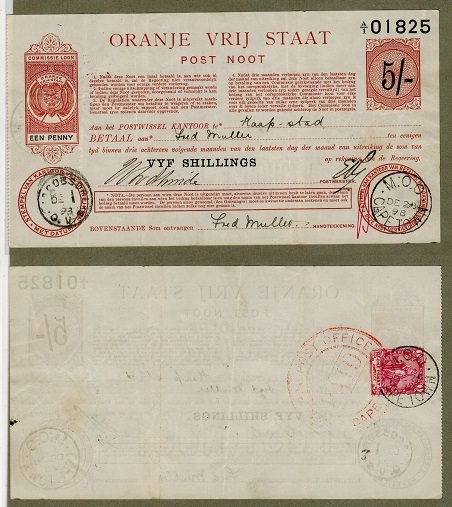 ORANGE FREE STATE - 1900 1/2d + 1/2d unused PSRC. H&G 29. 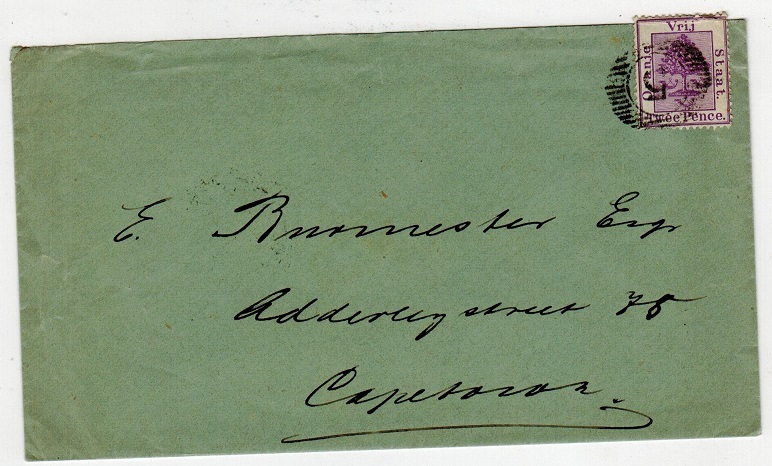 1900 1/2d+1/2d on 1/2d+1/2d Emerald green on buff postal stationery reply type postcard in fine unused condition. H&G29. ORANGE FREE STATE - 1900 1d on 1d PSC stuck by ARMY P.O.45/SOUTH AFRICA 'cto' cds. 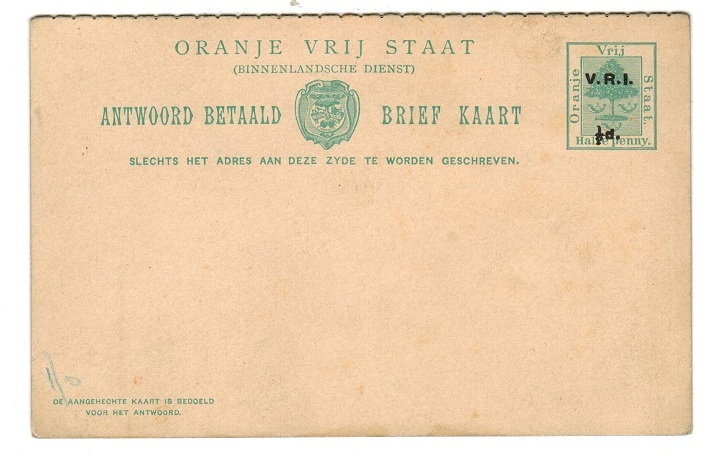 1900 1d on 1d orange on cream postal stationery postcard un-addressed and with no message but cancelled by neat ARMY P.O.45/SOUTH AFRICA cds dated SP.28.00. Mount marks on reverse. H&G27. 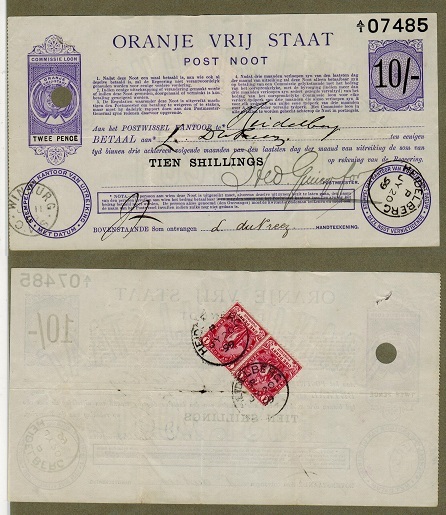 ORANGE FREE STATE - 1900 1/2d+1/2d unused PSRC. H&G 24a. 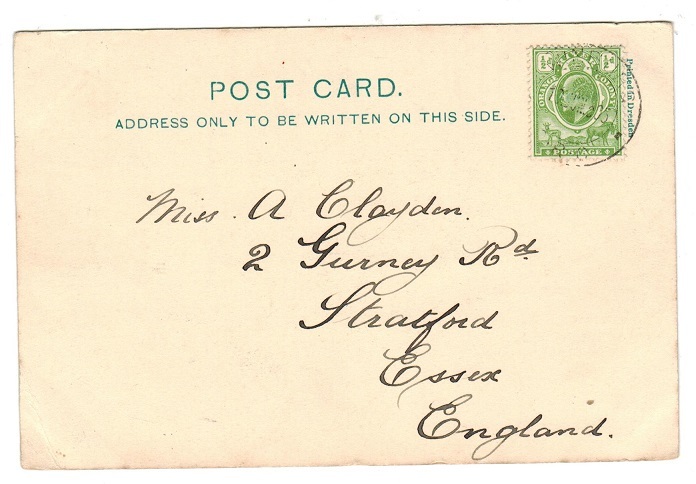 1900 1/2d+1/2d on 1/2d+1/2d Emerald green on buff postal stationery reply type postcard in fine unused condition. H&G24a. ORANGE FREE STATE - 1894 1/2d brown PSC used from LADYBRAND. H&G 12. 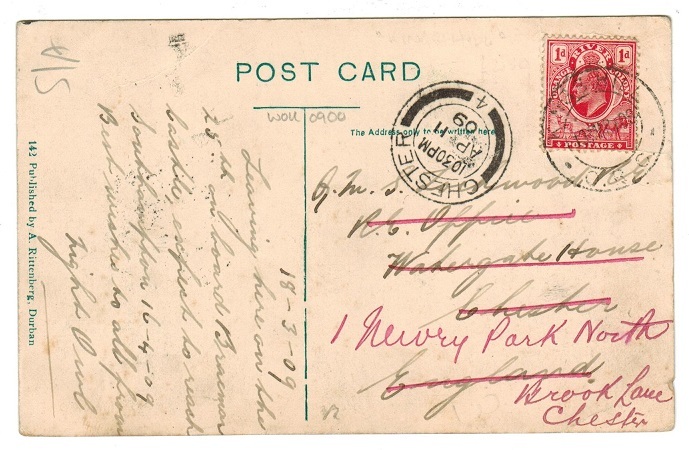 1894 1/2d Brown & black on white postal stationery postcard addressed locally & cancelled LADYBRAND/O.V.S. dated MY.31.95. H&G12. ORANGE FREE STATE - 1891 1/2d brown PSC used at KROONSTAD. H&G 6d. 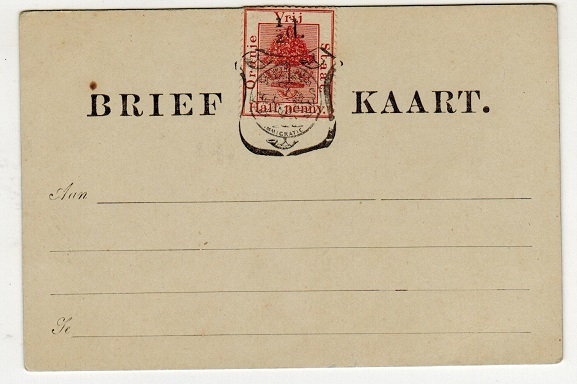 1891 1/2d brown adhesive on BRIEF KAART postal stationery postcard addressed locally and cancelled by KROONSTAD/O.V.S. cds dated JU.8.94. H&G 6d. 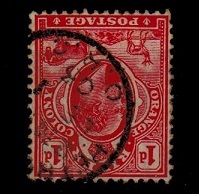 ORANGE FREE STATE - 1884 1d PSC used at BLOEMFONTEIN. H&G 1. 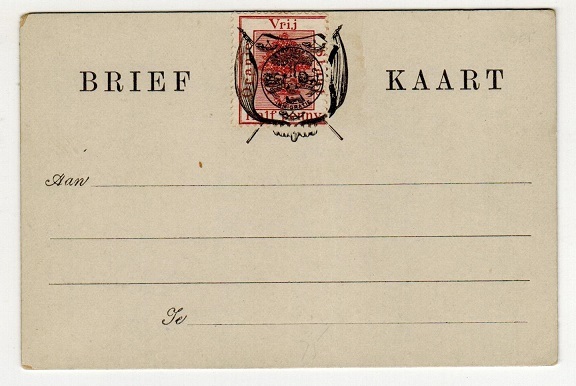 1884 1d orange on white postal stationery postcard addressed locally to Welper and cancelled by BLOEMFONTEIN cds dated AUG.26. (no year). H&G 1. ORANGE FREE STATE - 1889 1d FORMULA PSC unused. H&G 4. 1889 1d Brown & black on pinkish toned card postal stationery postcard. Fine unused. H&G 4. ORANGE FREE STATE - 1889 1d FORMULA PSC unused. H&G 4a. 1889 1d Brown & black on pinkish grey with red & blue granite type paper postal stationery postcard in fine unused condition. H&G4a. 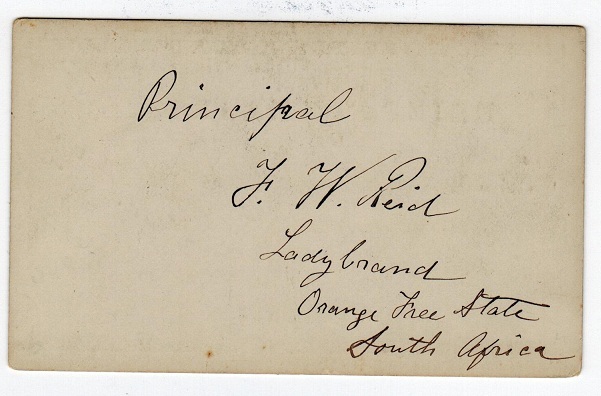 ORANGE FREE STATE - 1884 1d PSC to Uk used at LADYBRAND. H&G 1. 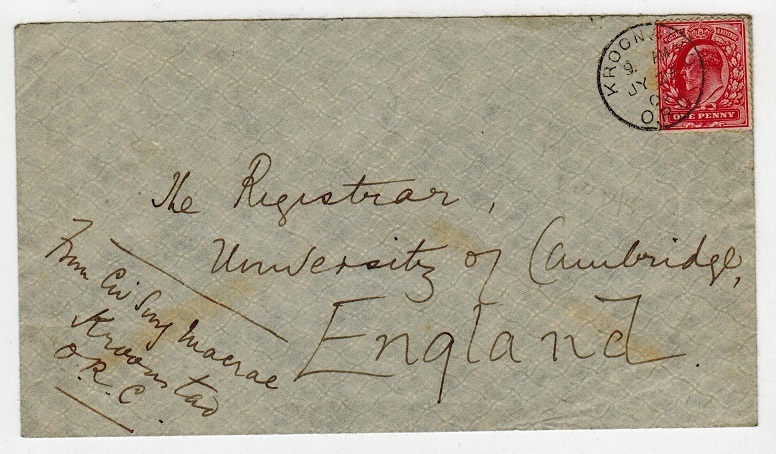 1884 1d Orange on white postal stationery postcard addressed to UK cancelled by fine LADYBRAND cds dated 12.MR.95. H&G1. ORANGE RIVER COLONY - 1909 1/2d surcharge on 1d PSC used at BLOEMFONTEIN. H&G 39. 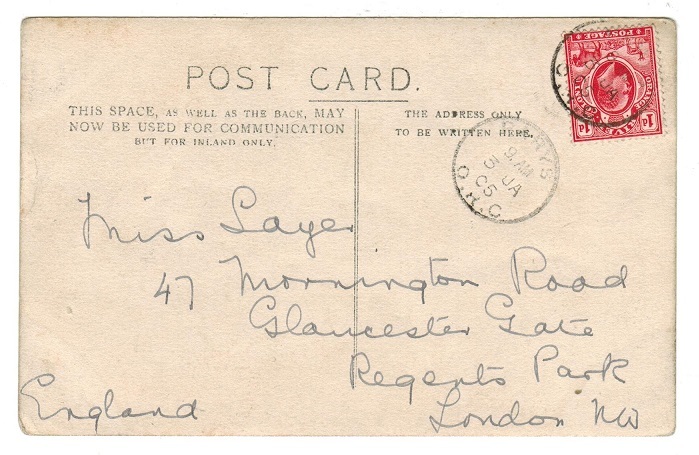 1909 1/2d black on 1d carmine on buff provisional postal stationery postcard addressed locally to East London and cancelled by BLOEMFONTEIN/O.R.C.3 cds dated 7.OCT.09. A scarce genuine use of this card. H&G 39. ORANGE RIVER COLONY - 1902 4d PSE with S.P.O.DON DON sub office cancel. H&G 1. 1902 4d blue on cream registered postal stationery envelope (size F) addressed to Johannesburg bearing additional 1d adhesive and tied by large d/r S.P.O./DON DON O.R.C. cancel (Batten type 258). This sub office being the only place to be issued this S.P.O. cancellator. Don Don was on the border with Basutoland and had only a bi-weekly mail service. JOHANNESBURG arrival b/s. A fine and scarce use of this stationery. H&G 1.